Hail to all and everyone that come to read this, and welcome. I have been a tourist around these threads for a long time, but just came around to my first post a couple weeks ago, drawn in by Briancj’s contest Discarded Treasure. After that, I jumped in the LoeR on-running competition too, and now I figured I might give a shot at my own P&M Blog, so here it goes. The use of clothespins as part of the build are a shameless rip from Chelnov’s entry in the previous comp, for which I am grateful. Primer is drying up as I type, I will update on this later on. And meanwhile, an attempt at a conversion I started recently, mostly as a reminder as to go back to it once the other projects are completed. Excellent work. Like what I see. Welcome to the community (the active part at least ). These are great! You have so much time left in the competition, you could make another gun emplacement. Keep 'em coming! @Camkierhi: Thank you, and welcome! @Fango: Thanks, but I'll pass for now, one at a time is more than enough. Great work, going to have to have a go myself soon. 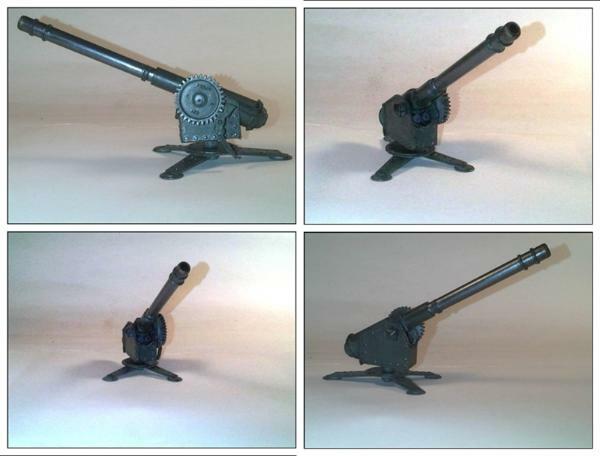 Only thing I am not 100 % on would be the size of the base/stand for the big gun. It looks brilliant, but it looks a little small. Not sure. I am probably wrong and its the perspective throwing me out. I hadn’t thought of it before, but now that you bring it up, I see your point. 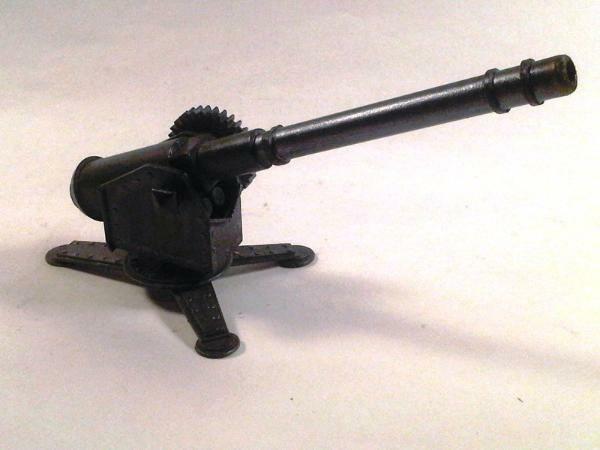 The hind leg is most likely too short – after a quick web search, the rear base seems to be as long as the barrel in most artillery pieces – so if fired, it would probably rollover backwards! Aiming (pun intended) at broadening the heavy weapons base after the lasscannons, I tried to put together a to-be-when-crewed autocannon squad. More to come, C&C mostly welcomed! @Sageheart: Thanks, and welcome any time. @Ruglud: Thanks, really appreciated. As I mentioned in the comp’s thread, I took me more than a couple attempts (Saved, of course, for an indefinite future use) to get to this shape, so having it found fitting is highly rewarding. 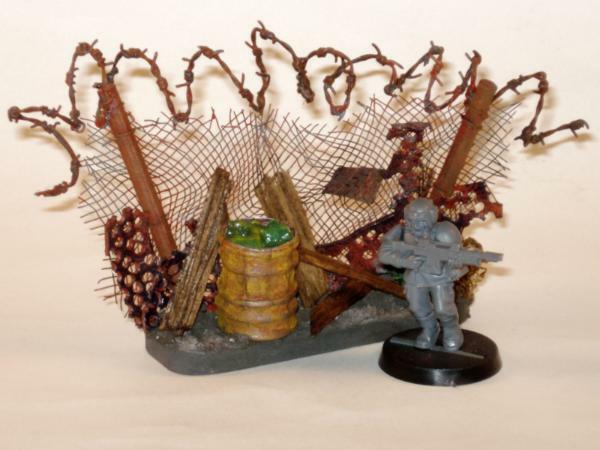 I’ve wanted to give the camo netting a shot for a long time, and found your entry in Briancj’s comp inspiring – liked the pallets too, been saving coffee stirrers since! – I’ll try it out as soon as I can. 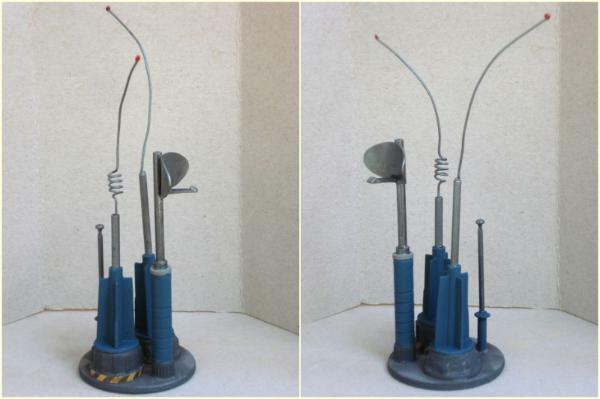 It is just a thin, single stranded wire, around 15 cents long, flattened and rolled around a suitable size tube (A lollipop stick, in this case), from the middle, for 4/5 turns, (leaving a straight length on each side of the coil). The coil is lightly stretched to open up the turns, and the final twists, to re-shape/position both ends of the corkscrew section, were made with a long nose pliers. Glued to a short length of tubing in the lower end (Again, the lollipop stick), and with a small drop of PVA glue added to the upper end. The other the parts are a bottle cap, an electrical piping nut, a plastic pen body, and some assorted bits from the throw- everything bin. 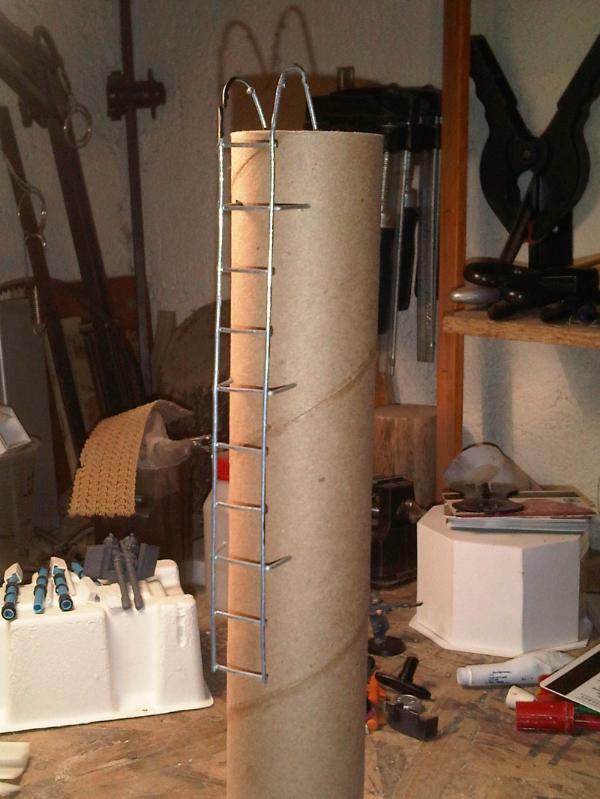 The parabolic antenna is an oval shaped piece of plasticard, heated with a hot air gun and curve shaped, and the shorter pole in the back is an actual Pop rivet. I’ll try to post a pic tomorrow to make myself clearer; surely it’d be better shown than told! @Victor: You are welcome; I'll be waiting then to see it in use in some of your upcoming proyects! There is some awesome stuff in this thread, I love the way you've taken a seemingly random collection of bits and bobs and turned them into something that looks absolutely seamless. The defence laser is especially awesome. Great stuff, and keep it coming! 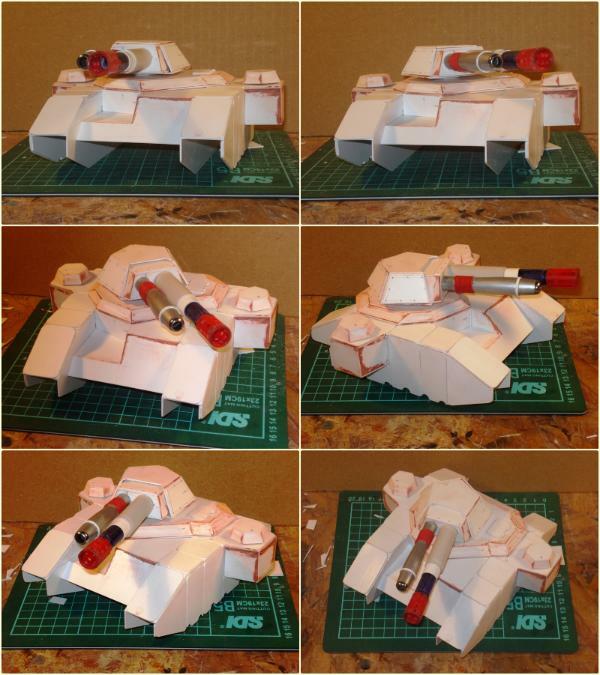 Also, did you use a template for the Chimera/russ scratchbuilds, as I've been looking for something similar for a while? What have you use to do the awesome round copula? @Paradigm: Thanks, and, yes, there should be more on the way, you are welcomed to drop by again anytime. As to templates, you can also check Armoman's thread in Zealot.com (http://www.zealot.com/forum/showthread.php?t=170912) there is a lifetime worth of work there. 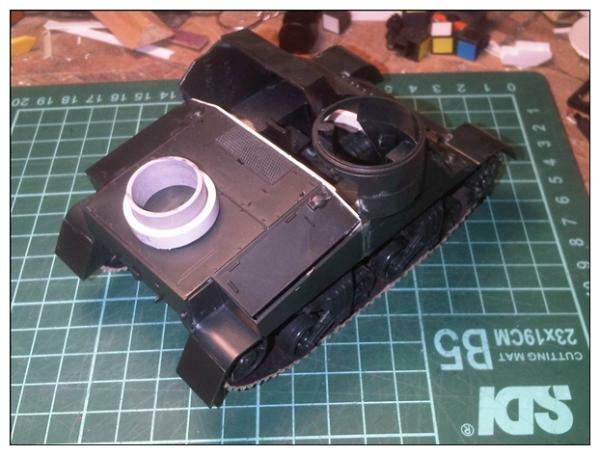 @Ilove40k: The gun cover is a spare for a minidome security camera, I closed part of the lens opening with plasticard and added the riveted reinforcement around it. This is the one I originally planned to use, the actual one came from a different, slightly larger, model, as that one ended up being too small. 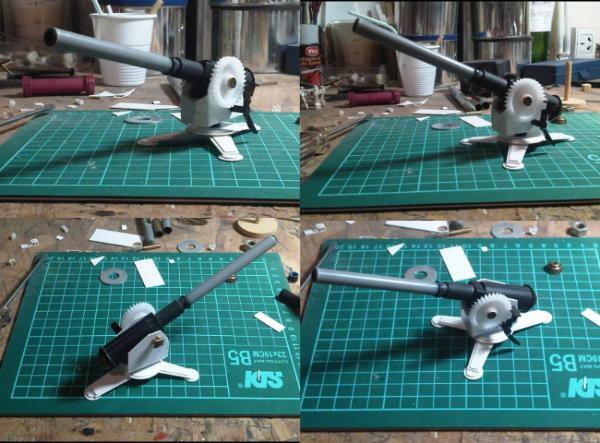 Thanks a lot I was looking to built a gun like yours for my campaign very nice idea and result ! Holy Gak!- We've got a gun-exert here! Some seriously amazing work man! 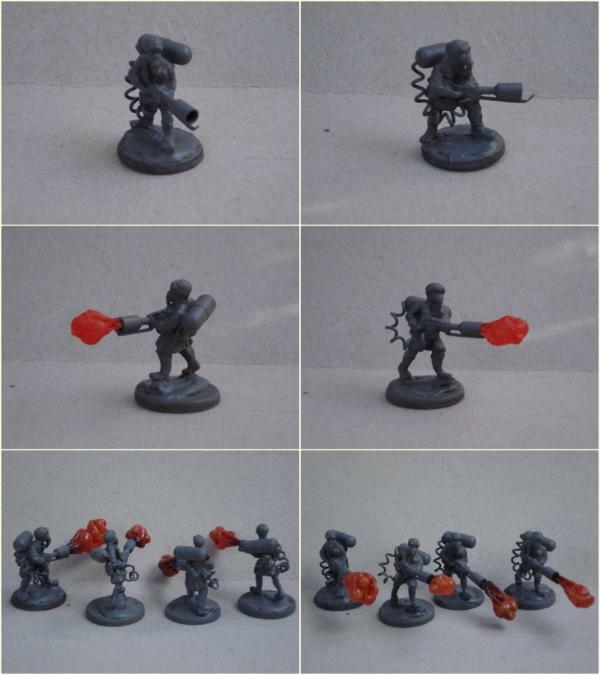 I especially like the to-be-crewed weapons! Brilliant idea! 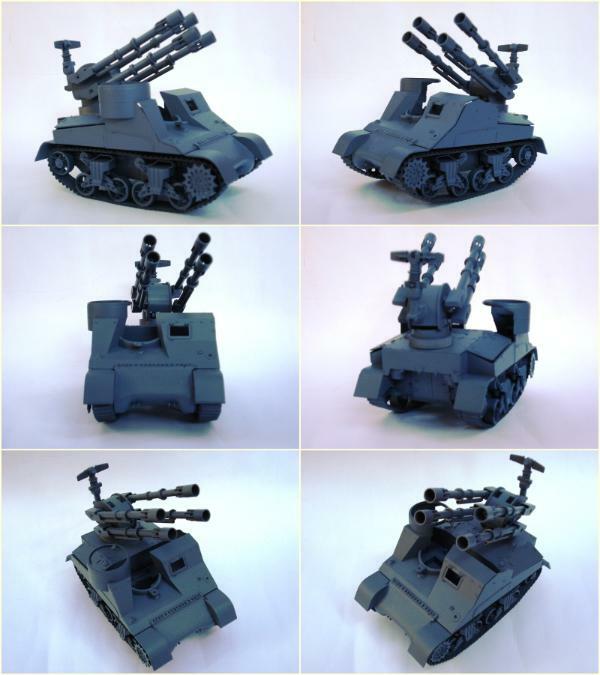 And the tracked autocannon carriage is fantastic as well! 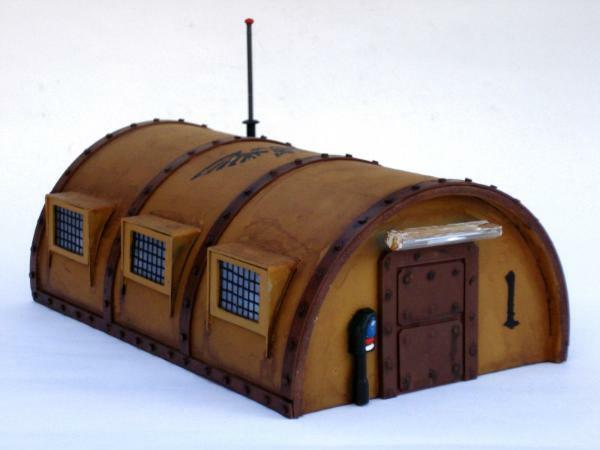 And extra-killy little mobile emplacement! 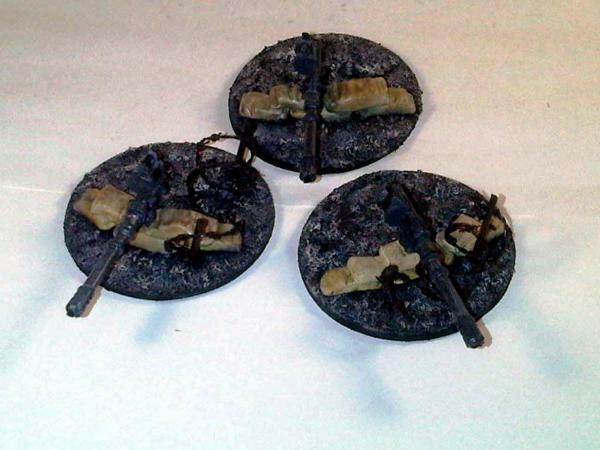 @Ilove40k: You are welcome, and please, try it out and comment! @dsteingass: Thanks a lot. No, no expert, but giving it a try... I'm quite fond of the little one myself, maybe even enough as to get back to it and paint it sometime! 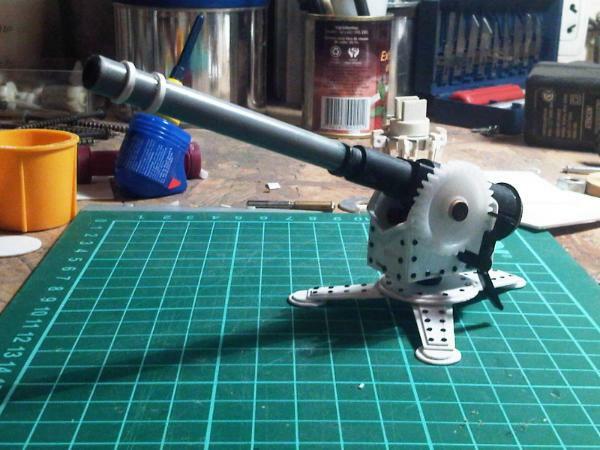 I'll will be painting this first, as a test/try-out before tackling the gun emplacement. @LeCare: Glad you do, and more to come, thanks. Great work, loving it all. Don't get too sidetracked dude, these comps sneak up on you. 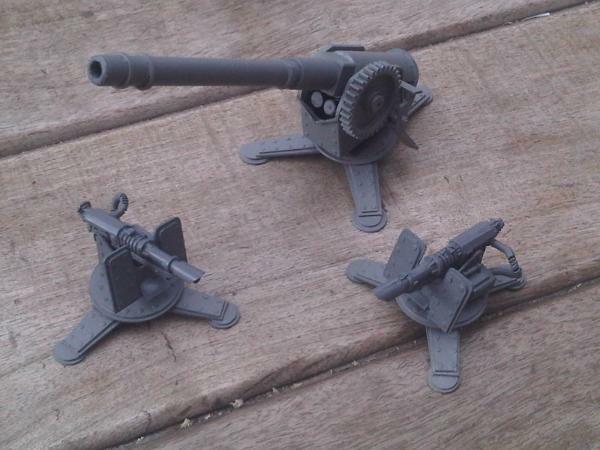 Love your guns, and the nice industrial pieces are simple but very effective. Now lets see some paint!! that new piece looks very good! 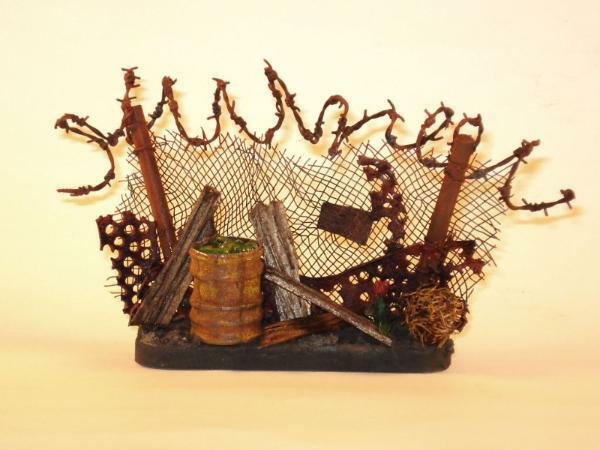 I really should do more terrain pieces... very inspiring! @Viktor: Thanks, glad you liked it. 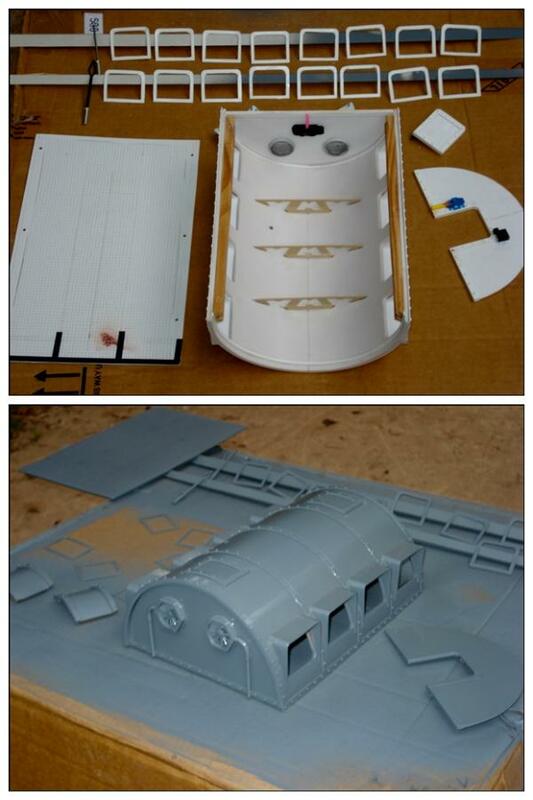 I am about to make a tank for a flyer base myself atm... how did you do the railings and the ladders? and specially...did you glue or solder? 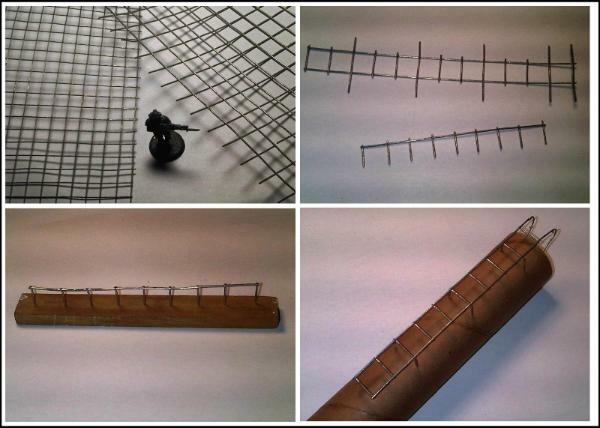 Top left, 1 and 1,5 cm square mesh; .75 and 1 mm Ø.
Drilled pilot holes where the railing or the ladder's supports attach to the building and fixed with a drop of superglue. 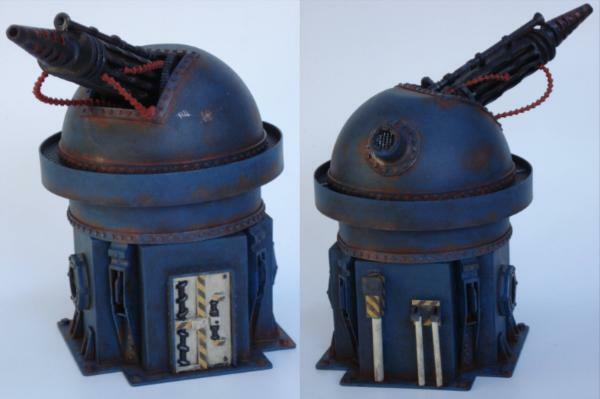 Nice work, I would have gone with a little more weathering, i.e. some rusty streaks, here and there. But having said that, who is to say how long they have been stood around without a lick of paint. They look great as is, and I for one would be very happy with them. Nice work. @Camkierhi: You might be right, maybe some stronger effects woul be in order, rust or leaks. Might give it a try and see how t goes. Ideas and suggestions are always welcomed. Love the colour choices. They look awesome. You will have to put some hazard strips on that as they will stand out amazingly. Great start. 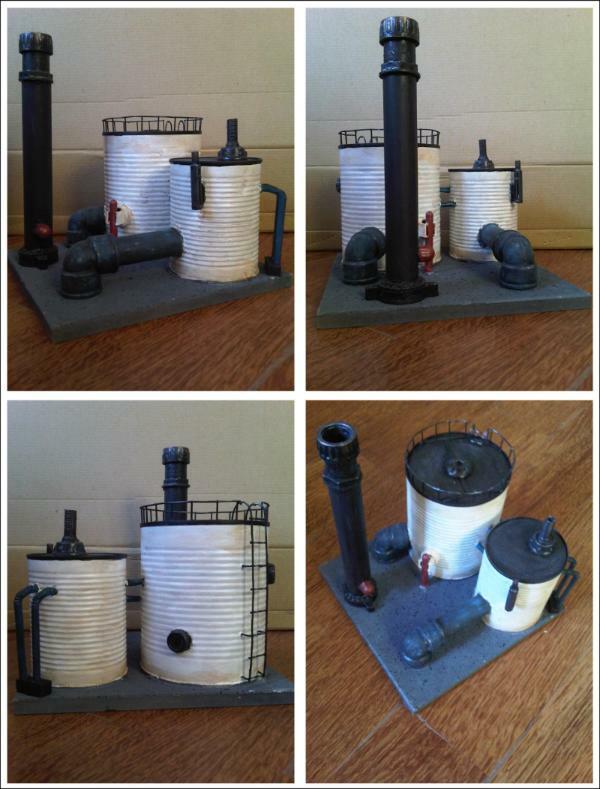 The finished tank terrain looks lovely! Specially the freehanded letters. 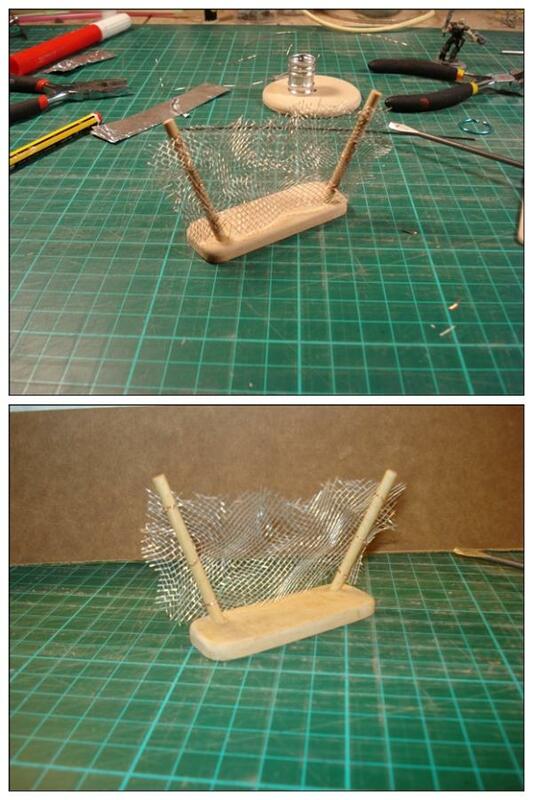 Then ... Of course the wire mesh ladders I should have known. As for the big gun I think paintscheme wise you'll have to obscure the cloth pegs better... Maybe hazard strips there? The rust and the blue main color look very good already. @Camkierhi: Noted, hazard stripes will be there then, will give a good contrast. Thanks for the input. On another note, I got third place with my power generator in Briancj's Discarded treasure comp! Making up for the lack of current updates, I digged up some WIP and took the finished pics of a more classic cardboard ruin. You have a very good finish on it, I don't mean it's finished, I mean it looks real. I am probably way off, but that's the colours I would choose. The white nice and rusty looking, would blend in a bit, the red would pop, and the door, just because Dave does his doors green. LOL. the rust and all those sweet details like the kill count are brilliant! Looks fantastic! I LOVE the weathering. The orange rust looks great on the blue! If one is going to copy, he'd better copy from the experts! Don't put yourself down, that painting you have demonstrated so far is brilliant. While slowly dabbling paint some more on the gun emplacement and browsing tutorials on OSD (It's too early yet to decide if thanks or something else are due to Viktor for that suggestion! ), I gave in to hobbyist's ADD. I received some designs from Hyenajoe a couple weeks back, hope I can do them justice. ah.... that looks like a healthy suply drop of plasticcard!!! Littletower, I am liking all of this! is like Vik in some ways, but different. you two scrap recyclers are like two peas in a pod for the amazing use of stuff that would otherwise be seen as throw away materials by others. @shasolenzabi: Thanks, and welcome. 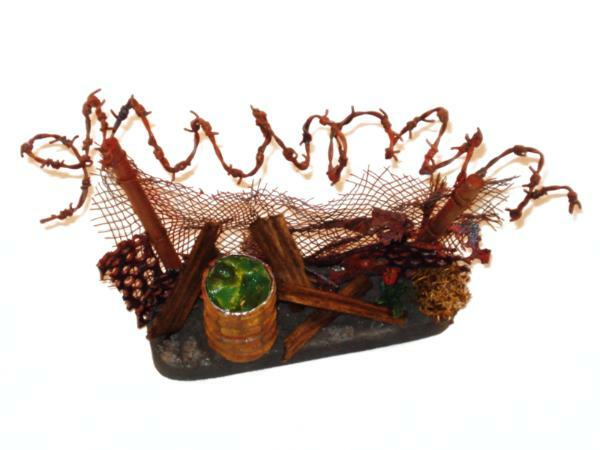 I enjoy the building or making of things, and using - as you put it - throw away materials gives it an extra twist. Problem is, you start seeing interesting or potentially useful shapes and pieces in everything, and stuff piles up much faster than it can be converted! Well, as long as it is all cleaned and made good for converting while sitting in the pens for the work it inspires. I wonder what that will become? Hmmmmmm. 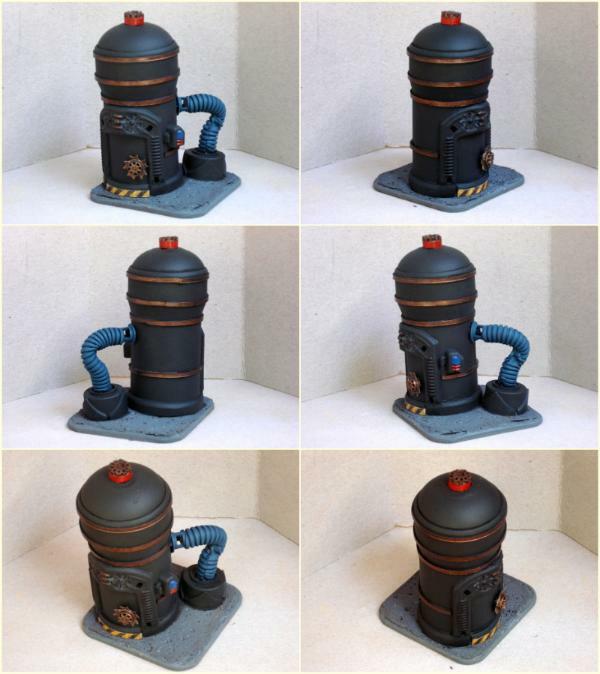 Love the conversion work especially the cannon. 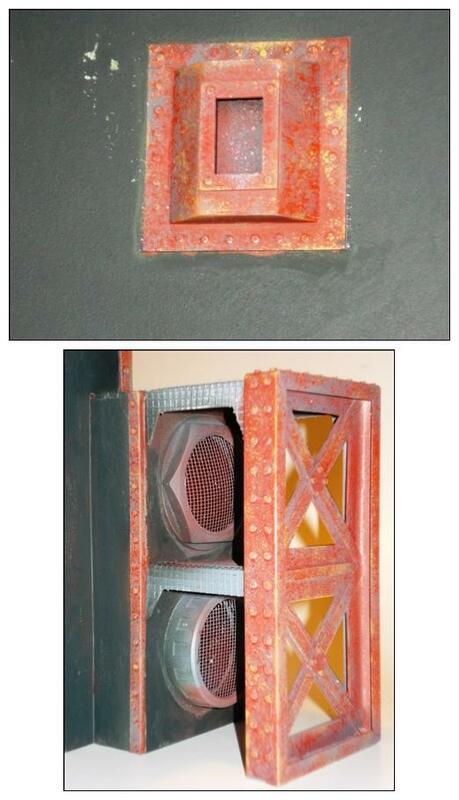 Gotta admit i am mighty jealous of all the plasticard work and the level of detail. Really nice. @sennacherib: Thanks. I must say, I just gave a quick look at your thread (Bookmarked by the way to go through at leisure later, with more time) and there's nothing you should be jealous off! I'm sorry, I didn't mean to tease on what the build is supposed to be - I guess I just figured that, as I knew what it is, it'd be obvious from the first blurry pic onwards for anybody else -. Obviously, it isn't (And it's happened before to me too, and apparently I still don't get it!). But, as it came out like that, I might as well let it be then. Erm...is that developing into a fortress? @Victor: As close as it can get! 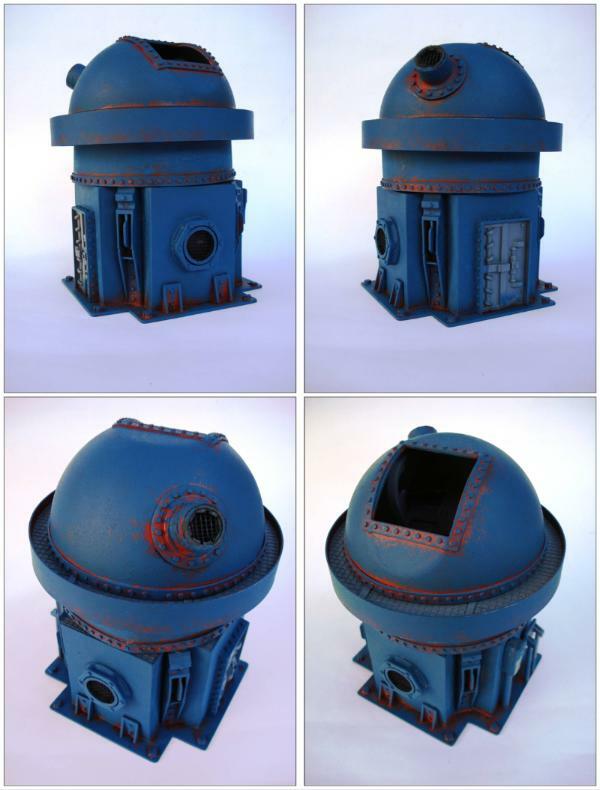 It is supposed to be an Imperial Bastion, based on the cardboard & bulkheads kit. Sweet...... are you working off templates? 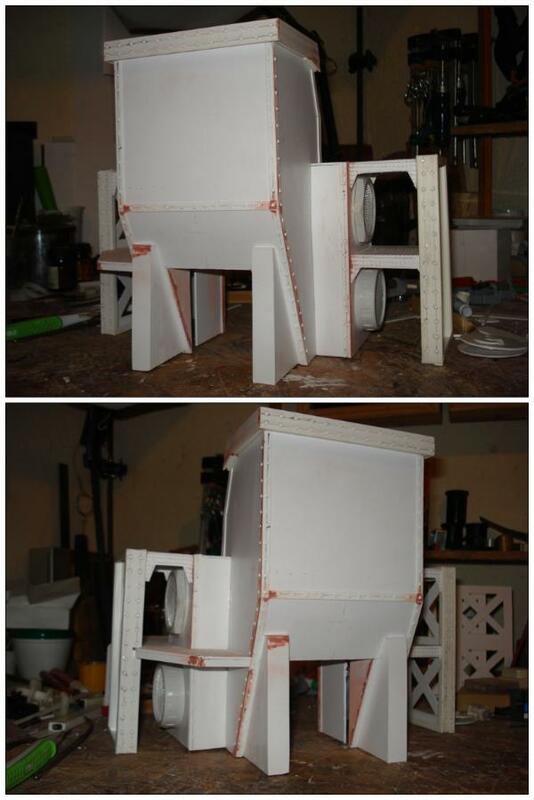 @Viktor: When you brought up the fortress idea, I paid some more attention to the projected dimensions, and it appears it will actually be sized more like a stronghold than like the current bastion kit. As it is coming along – and so far I’m trying to keep as true to the original as I can, without actually having one at hand for direct comparison – just the main center build is as wide as the plastic bastion, so it will probably end up being rather big when I add the side structures and sidewalks. @dsteingass: Sorry I skipped your post, it appears yours came in while I was typing mine! It does look like the gatehouse section of a city wall, doesn’t it? It will have to be more self-standing than that (No room for a full sized wall! ), but attention will be paid to the door/gate of the build as it is. @Camkierhi: I am, handsomely provided by Hyenajoe (Along with a great set of WIP pics of his). On the workbench right now, update to follow soon. 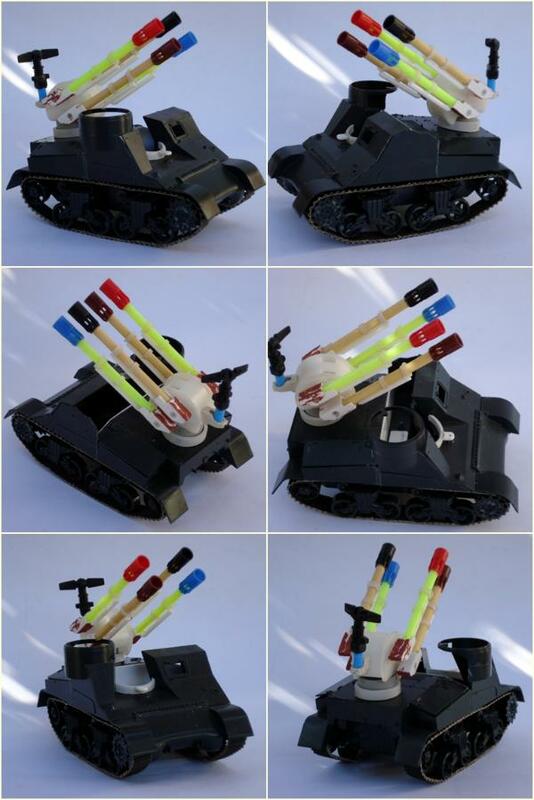 brilliant idea...will there be defensive weaponry? 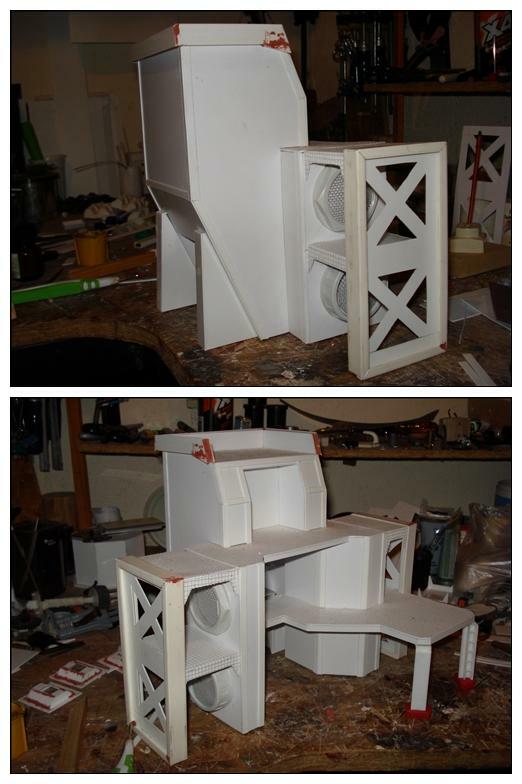 I'm (trying to) recreate the old cardboard & bulkhead Imperial Bastion, in it's actual dimensions, using the original cardboard parts as model for the plastic build. What I meant is that the current plastic bastion kit is smaller than the old cardboard one (And thus, mine will be, of course, bigger then than the one sold today). (As I said, just the central piece - the main tower, the highest reaching part - of the old model is almost as big as the complete new bastion, and the old one has, moreover, an outcropping coming out from each side, extending it further sideways). As for the weaponry question - which is actually the important point of all of this, isn't it? - I'll give the stats of the fortification rules (oe access point at floor level, one/two firepoints per facing in each level, four emplaced heavy weapons, one on each facing, and battlements for the roof level, plus the possibility of adding a comms relay or a gun emplacement), for the - wierdest of cases - event of it actually being used in game. for the - wierdest of cases - event of it actually being used in game. 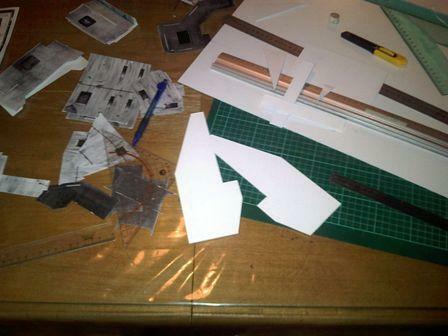 Remaking card terrain in 3D...after me own heart! Will start next with the simi-bulkhead sides ans supports. Looking brilliant. Hope that's not your gun from comp piece! 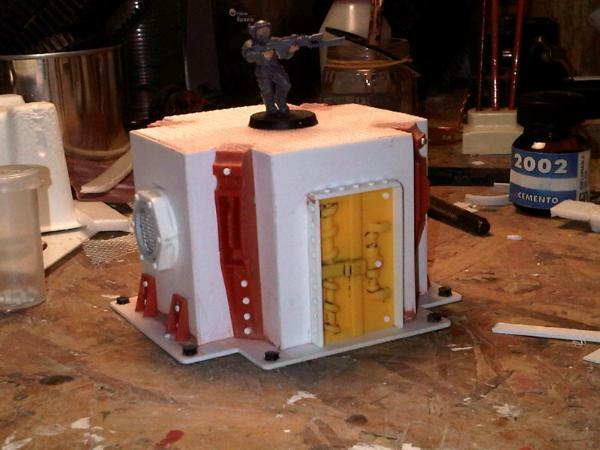 @Camkierhi: It is, but just because it was laying around on the workbench, it will go back to its own emplacement for the comp! @Viktor: Come on, cut me some slack here, it's WH40K after all! Don't they look like one meter thick reinforced concrete to you? Bear in mind though that, when the rest of the walls and supports get added, only a few wall and platform's edges will remain visible - mainly the roof battlement and the side walkways -, and those will be strengthened/thickened to a more appropriated width. @Viktor: I know, and I thank it. I go through other people's threads for learning, ideas and inspiration, and I post in mine for input and feedback, so ich danke Ihnen sehr für das, was Sie gesagt haben. Even more, in this case I fully concur with your point of view and had planned to work into it as the build advanced. @Ruglud: I couldn't agree more, the classic version layout is far more entertaining than the actual squared tower. 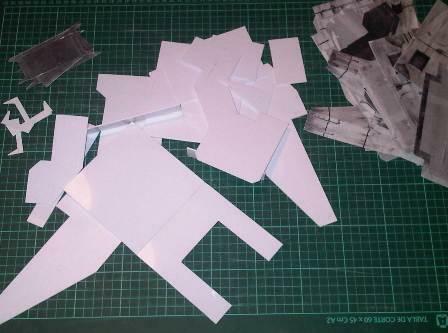 Glue is press-drying as I type, building up the edges as discussed above and adding more pieces. Nicht doch so förmlich mein Freund^^. How come you write such a flawless German? The whole construction is steel based, right? So bound to have rivets,eh? I guess it's supposed to be reinforced concrete and steel, yes, so at least the bulkheads, doors, battlements and walkways supports are going to need - a lot of - rivets. That is looking very nice! this is a good piece of work! Fantastic work!! Can't wait to see it progress! Will start punching rivets later on, there's no way this thing will hold itself together otherwise! The eyes of the -=]_,=- are watching! Luckily, door has reinforced plating and - could it be any other way? - riveted bolt-locks! Not much progress expected today, slow-time is keeping me away from the workbench yet. , I was bluffing, and my bluff got called! (I was talking about the real door, but it is just wood, not plated or bolted! Talent draws attention is all. @shasolenzabi et al: Thank you all, and sorry for the delayed reply. Added the side bulkhead-look-alikes and platforms. You'll notice there are no rivets on in yet, my rivet making tool of choice (revolving hole-punching tool) got seriously WIA after punching the third (Yes, actually the third) rivet the other night, so I'm sort of short of 1 mm roundlets right now, hope to fix it ASAP. But do no despair, rivets will be there. And firing points. 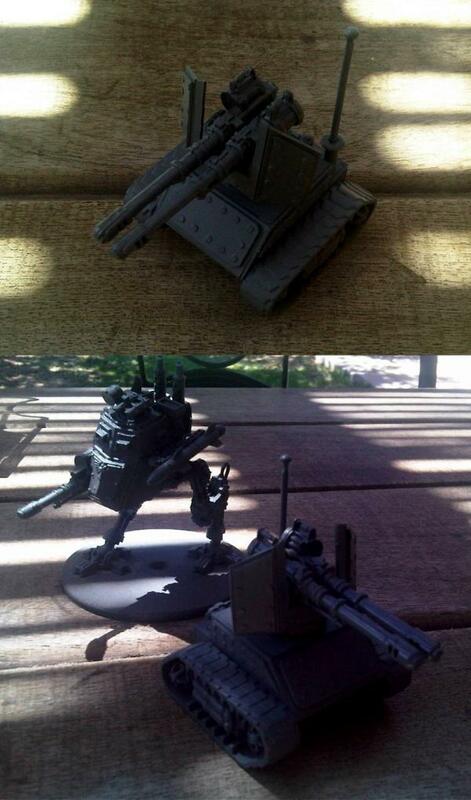 Lets not forget, there are two things you can never have too much of in the 41st M: Rivets, and dakka. Thanks for reading, will be back soon. To make it count as the current bastion, it should have one on each side, featuring heavy bolters, but I don´t think one would fit on the rear facing, will see how to fix that. On the other hand, as I said, it's significantly overgrown the present official version, so there wouldn't be much point in making it rule-compliant now. @Viktor: Thanks, I'll try to live up to it! Sanding and gap-filling (Those close-up shots are far too revealing) are on the to-do list also. Reinforced edges added, and started filing, trimming, sanding and filling. Some more painting done on the League's Comp entry as well, not enough for pics yet, though. Not gonna lie, from some of the angles from the rear... it resembles a toilet. That looks fantastic. Really like the firing points. Whole thing is looking very solid now. I really like the vents on the side and all the riveting work! 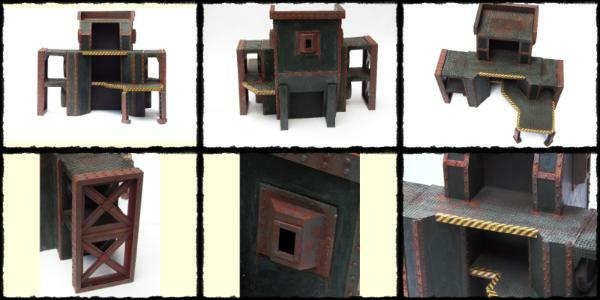 It gives a nice industrial look to your bastion. Man! That is looking FANTASTIC!! Really top notch work! the rest is looking brilliant! @Camkierhi: Thanks, and sorry for the late reply, it's been a busy real-life week. @Hyenajoe: Thank you for dropping by, and glad you are liking it so far. You are sort of the creatures intellectual father, so to speak (Meaning, of course, I blatantly stole the idea from you), so your comment is doubly appreciated. If it is putting you to shame, be assured all work on it will be put on hold until your own catches up ! @dsteingass: Thanks again, it is slowly coming to shape. I spent the evening laying out the riveting on the back (if I'd done the math beforehand, I would have gone with welding instead! ), and fiddling with ideas for railings for the walkways, but nothing picture worthy yet. Thanks for reading, hope to be back with a decent update soon. Current update: Rivets on the back. amazing looking...i hope you have fun painting!!! oh----ha!....now this looks as if serious business is happening!... i cross my fingers for some quality outcomes! Maybe not exactly what I was aiming for, but it'll do. It [b]is[/b] textured, just less than I expected. 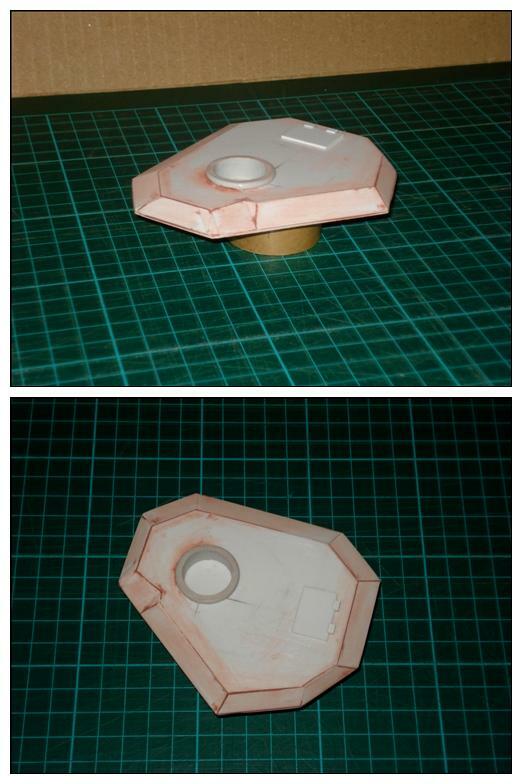 Further painting and weathering should add more depth and take care of the excess shine too. That looks really great man! 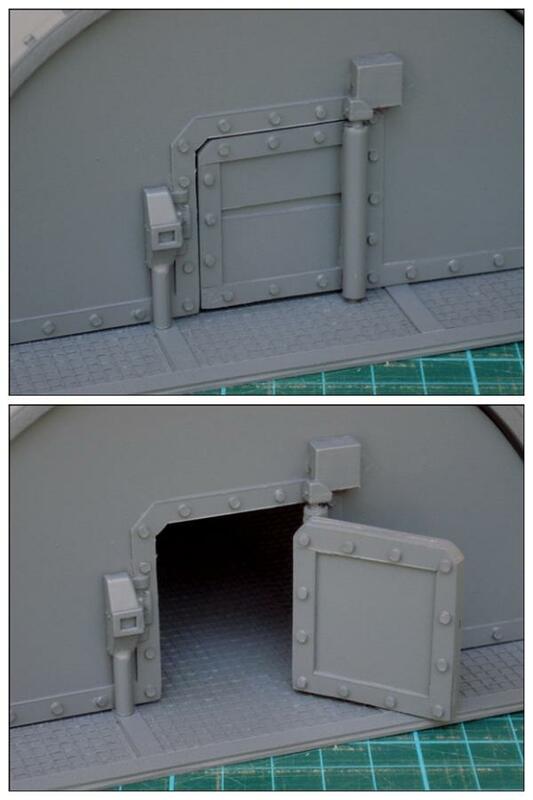 I'd planned for concrete walls with metallic reinforcements on the edges, and metal for the firing points, vent grills, walkways and side supports (Basically, the current darker grey parts). 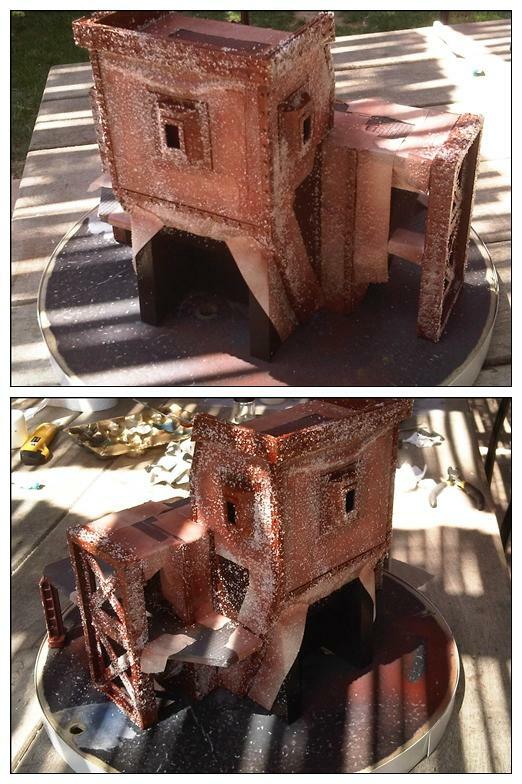 A basic three-colored basecoat (Concrete, metal strips and bits, and flooring), with added rust, weathering and maybe battle damage. well...then just plan your added damage like wholes and scratches... and i think you are good to go!!! More and more impressed by this great build. So promising. @Camkierhi: Thanks for stopping by, glad you are liking it so far. If you can find any spray in truck bed liner in can form, try that, it usually has a gritty texture to it. @Nowlan: Thanks, will save that for future use. As thought, not much got done during the week. I just got to break out my new airbrush (Very cheap single action bought on sale in the supermarket, just to try out, never used one before) and give it shot. Will try to fix it up and keep on painting in the upcoming weekend. @Ruglug: Thank you, I couldn't agree more with the the more coats part , will do ASAP. 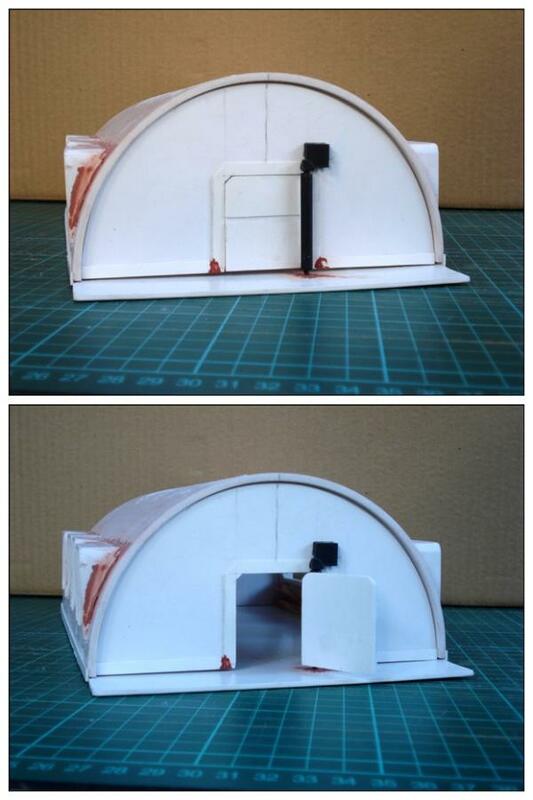 Very nice scratchbuild. I'm looking forward to see how you paint ant weather it up. Some advice. I picked up a cheap bamboo lazy susan at Wal Mart. 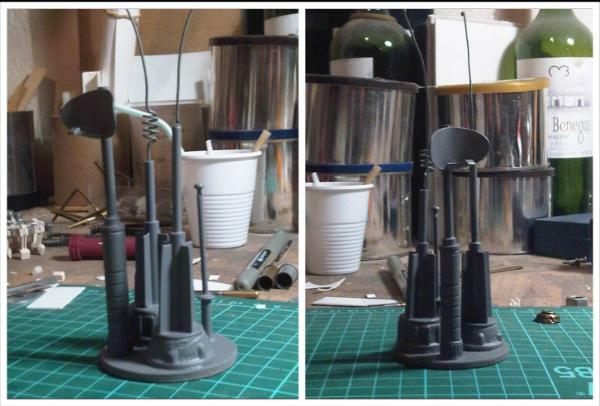 It helps for drying quickly between airbrush coats in front of a small fan. The Fan I have is maybe 8" in diameter and has 3 speed settings, and is LOUDER than my new airbrush-specific compressor (Badger TC910). @Galorn: Welcome, and thank you. Experimenting with an airbrush with this one, hope it comes out well enough. @Viktor: Sorry, got sidetracked (again), but will come back with more later. Drying times are quite short, actually (weather helps a lot, warm, and very low humidity), I just have to tone down on eagerness and go with several thin coats, might try a fan for extra speed. WOW! 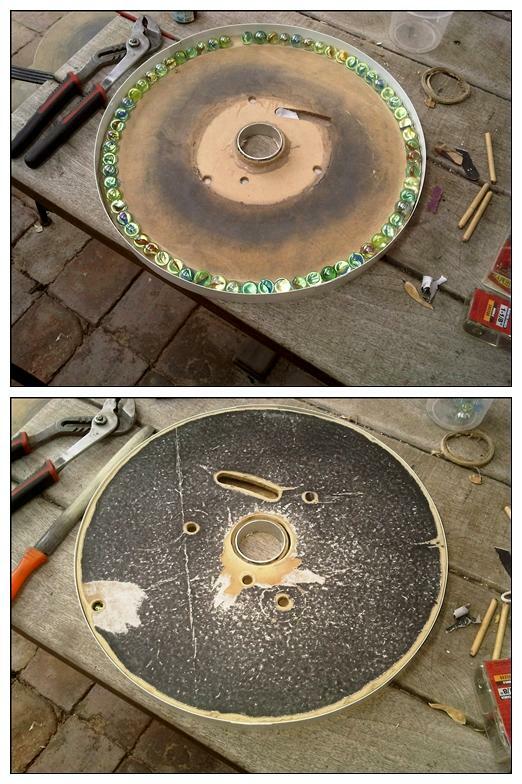 Scratchbuilding a lazy susan/turntable is very, very impressive! @Viktor: I guess I should have seen that coming ! Waiting for the paint to dry to unmask, clean up, and find out how it cames out. Im anxious to see how your salt weathering turns out !! @FarseerAndy: Trust me, I am as well! And thanks for stopping by. Still a long way to go, but moving onwards nonetheless. Great work so far with the build. It really looks spot on, especially with the hammered paint, that will give the extra flavor to it . I like the vents on the side, but hunk I will steal that idea and alter it slightly. I think making a doorway that looks like it would spiral open would be wicked . I like the camo you choose, über cool. Looking incredibly good, let's see how your weathering turned out? Like the camo too BTW. 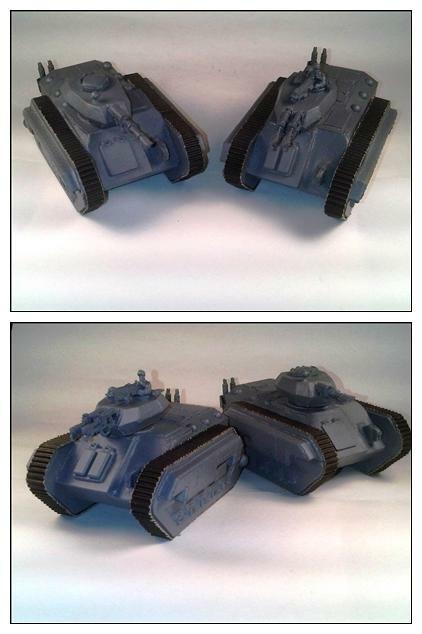 tank is an intersting scheme too! The concrete walls need to be weathered to match the rusted metals, the rust will be toned down a bit (Too much corrosion came through the salt-painting, I’ll go back to it and “recover” some more of the chipped paint), and something will have to be done about the walkways, figuring out colors yet. As for the tank, I basecoated the two I'd made in the same blue, and ran out of masking tape just before I could do the second one. Seeing the feedback it's got, I'll surely paint it to match. Advice, comments and criticism more welcome than ever. I think toning down the rust will really help this out, right now it's too big of a contrast to me, getting more of the metal back will help I think. I lo think the hammered gave it just the right amount of texture for the scale on the walls . Rust looks PERFECT! very nice. Rather than toning it down, I'd do some AB weathering on the darker color now. Light passes from 6-10 inches away. People: Thanks a lot for your input and feedback, truly appreciated. I think the pics are not doing the paintjob a favour, the contrast is exaggerated and specially the red in the rust pops out quite more on the screen than it truly does. Nevertheless, it is contrasting, maybe too much. Couldn't get back in time for a daylight picture, to properly show the real colours, I will tomorrow. @Theophony: Glad the texture shows, I thought it might get lost in the pics. @Viktor: Haven't done much work on the concrete walls yet, indeed they look mint new yet, and that will not do. I'll weather the walls as the next step. And for the walkways, I was thinking railings, but hazard stripes along the edges sound quite good, will try them out . @dsteingass: I still think it might be too much, too bright (Makes me think of a severe case of skin rash), but I'll wait until the walls catch up before making a call. I will work on them next, just not sure if AB them, I can not see me masking it all over again! Would some washes do? Still arguable quality pics, but closer to the real thing at least. Well, that looks way better! Still a bit more red than I would do myself, but if you now get the concrete to look lighter, than I think this will work . By the way, congrats for hitting the front page!!! No masking, just a dusting from a distance. Remember, it would all weather the same, even if the walls didn't necessarily rust like the frame does. Washes ALWAYS work, and you never have to decide either or, you can always have both. Short break to go back and move on with the League's comp entry. Looking sweet dude, love the bastian. 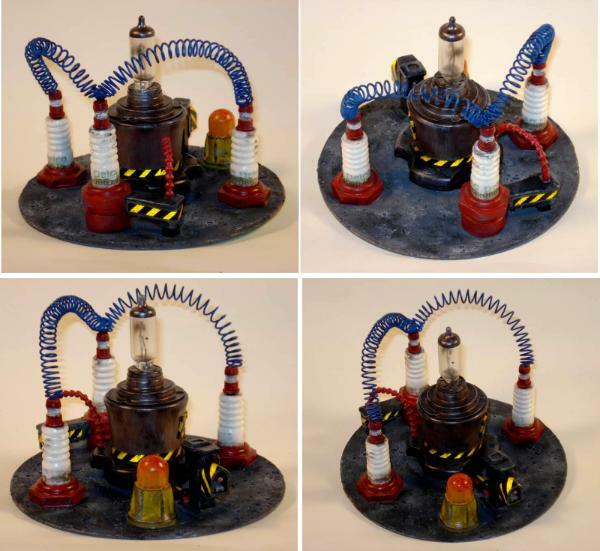 And competition entry looks awesome. 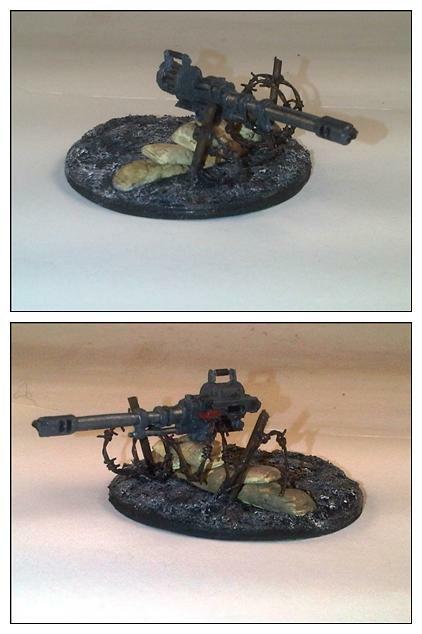 Gun will look great with some OSL. The glow from the tip doesn't get where to reflect, and the weaker attempt down along the barrel doesn't show. Please keep been critical, all the advice is welcome. [Edit] PS: But I did get to paint the tubing white and put some hazard stripes on it! @Ruglud: Glad to see you around, thanks for stopping by. (Worked some more on the rust, dirtyed the walkways, and gave a first wash to the walls to weather and bring the contrast down a bit). 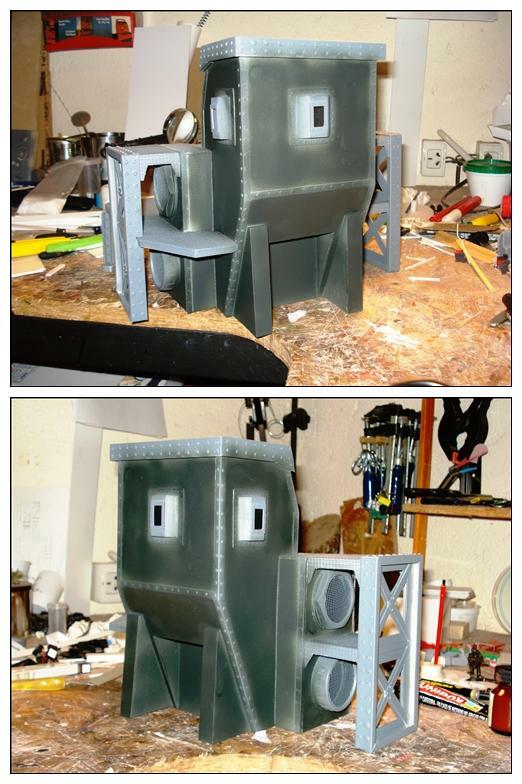 Nice work on the turret and bastion. Liking the rust work. @Dr H: Duly appreciated, thank you. I might go back to it some time in the future for touch ups and another swing at the attempted OSL, but I'm moving on for now. Looks brilliant, good luck dude. Excellent effects used. 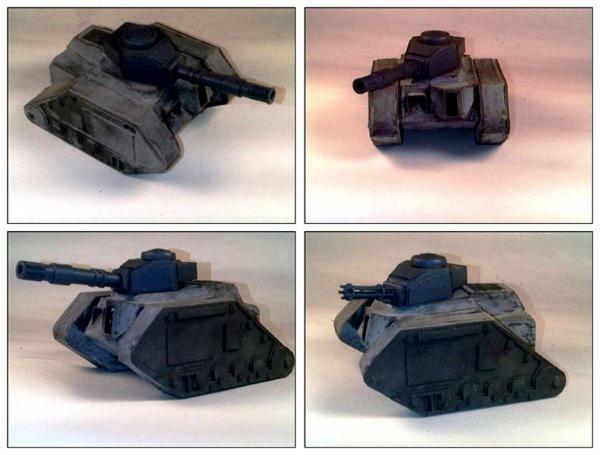 Original 1990's cardboard Imperial Bastion remake. New project (Actually, going back to an old project put aside when I jumped into the competition builds, now on the workbench again). In between then and now, I changed my mind - I had thought of it as a Chimera before - and decided to try to go after an Hydra look instead. Thanks for reading, and comment and criticize freely, input is welcome. Awesome work LT, the gun emplacement is class, the Bastion is amazing and that tank is going be great - love the quad gun - what are the ends of the barrels? Look like bits you find inside spring loaded pens? Gun emplacement is excellent, and Bastion wonderful. You have a brilliant way of painting up you scenery. As to current project, looking very promising. Like the quad gun look. 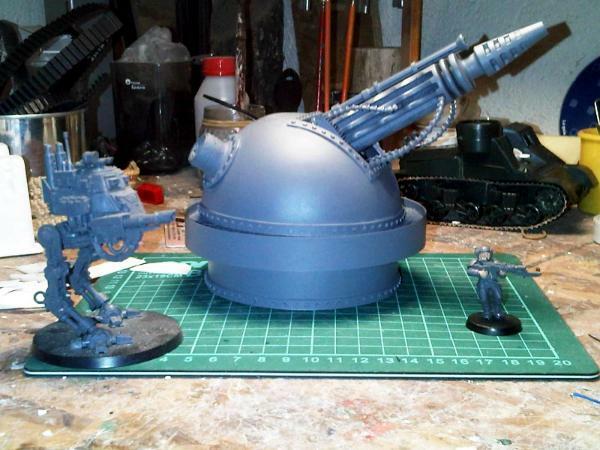 @Ruglud: Thanks, though sadly the gun emplacement got so badly dwarfed by monstrous Berfa! As for the end of the gun barrels, they are the caps of dried out felt tip markers, with the closed end cut off, and angled filed. @Camkierhi: Glad you are liking them so far, some more work coming up next. Awesome. looking cracking dude. Lucky on the driver too. 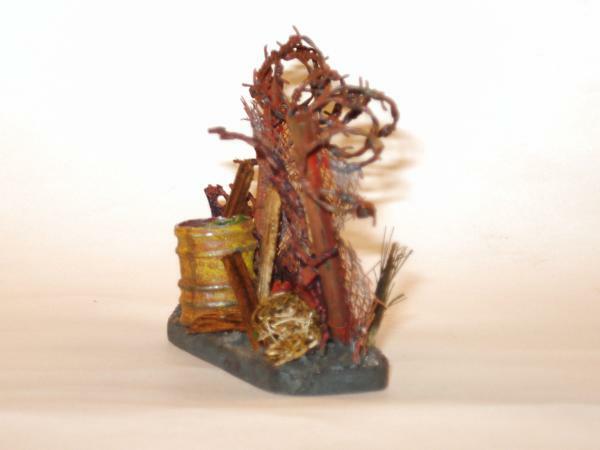 I have that same kit but then I went for the easy stuff and made a Basilisk out of it. Honestly for a Chimera it's too wide and shortening made it weird much better as a Hydra..
@Miguelsan: Thanks for stopping by. I’ll tour around your thread for more conversion and count-as inspiration and ideas to steal. I found Kilkrazy’s article on Scale Model Kits for 40K (Saw you commented there as well) as reference for vehicle sizes. 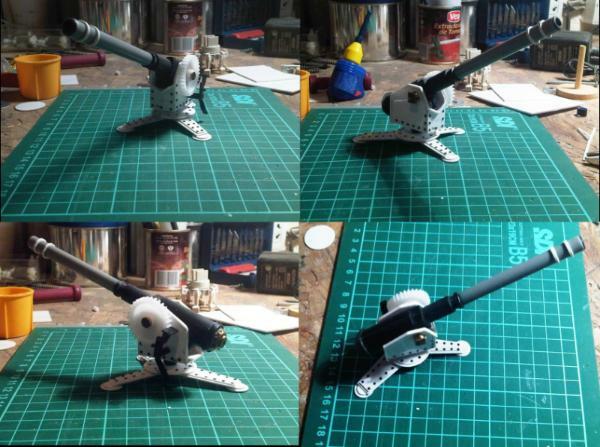 To bring the hull to length, I cut out the mid section and removed one of the track boogies, but it still is too slender - 7 cm wide, against the 9 quoted - And a bit too tall as well, but that is concealed by the oversized quad gun over it. The shortened tracks might have ended up looking somewhat weird – with a too short footprint – but I think the overall result will do. 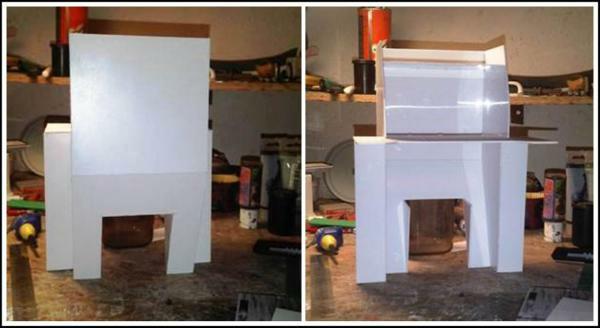 @Lone Cat: I’m sorry the paint does not do it for you, the building is supposed to be concrete, not steel made; the metallic parts being only the side supports and columns, firing points and edge reinforcements. Touch ups and highlights next. 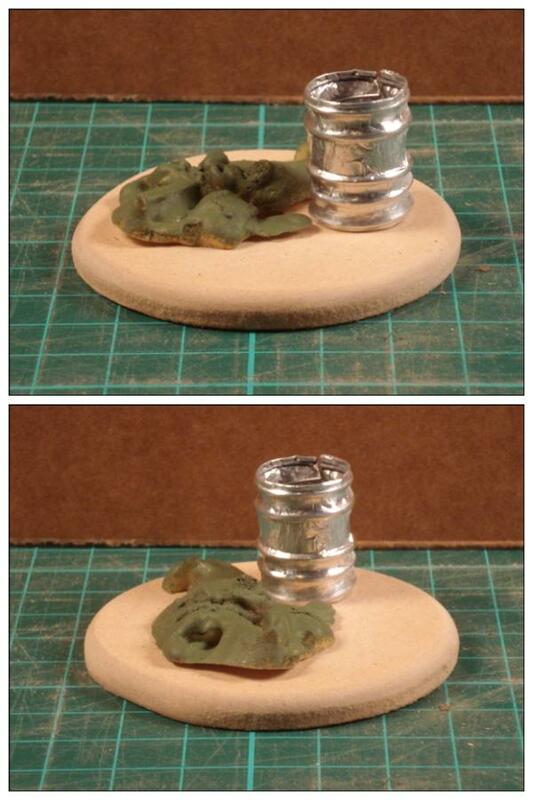 Joined in Skalk Bloodaxe's terrain contest. Actually, after I found those, I went after the guy sealing the boxes and got an almost empty can of the stuff for further experimenting as well. (Didn't get a picture of that, it was awkward enough to ask for it, having him pose for a pic while he was giving me the used can as well would have probably been just too weird). PS: @Camkierhi: Thanks, glad you like it so far. Paint is on hold pending a pressure regulator for the compressor (Too high pressure output for an airbrush), an airbrush specific compressor (Doubtful for the time being, though it be nice indeed), or the right mood for doing it the old fashioned way! hey LT... i am feeling really bad for missing out on so many wonderful looking updates of yours...!! 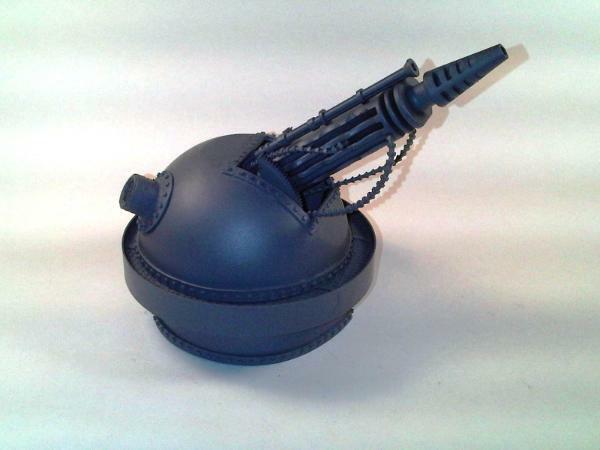 !the big gun looks so cool...the balldesign you really pulled of to the finest! then the bastion looks amazing too...subtile amount of details... the whole thing works as a complete unit and no details fight for attention against each other... i like that very much! 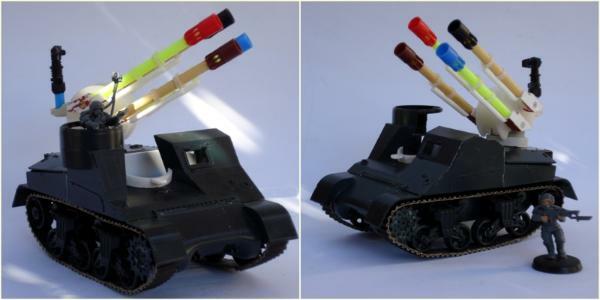 then you started with a tank...and what a tank... nice choice for the chassis... and the flak gun is amazingly looking!the caps of the feltpens you used in a very unique way... the muzzles have actually the right cooling holes!...primed it looks like a comeplete bought kit!...what a talent! as i am getting older by the day...i can´t realy remember these trees... how did you make them? but what i can say is...they remind me of trench war sight i´ve seen... very convincing looking plantlife! 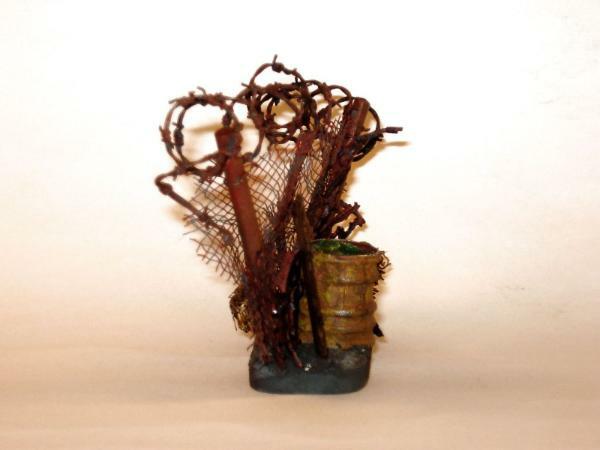 Plan A revolved around rusted and weathered drum/drums, with a toxic spillage. That had two advantages: First, I could aim for the extra credit points for the spontaneously found and picked up junk by using the polyurethane foam for the spillage, and second, I could even give a shot at OSL radiating from the waste. Not discarded yet, but not sold on it either. Meanwhile, an alternate plan sprung along, something else I’d wanted to try. Not sure if it isn't more of a build than a junk pile, though it is indeed made of mostly junk. As in doubt, more junk added. Primmed and basecoated - red for rust effect for the mesh, poles and planks, green for the plant - and tinted the woodboards. Figuring out yet how to deal with the tumbleweeds. 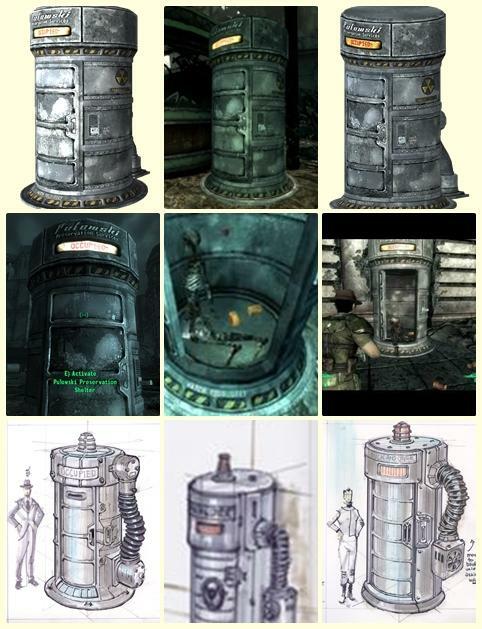 If more junk is needed for it to actually be a [b]pile[/b], I could pack in the drum and the toxic waste in as well. PS @Viktor: Sorry for the delayed response! Nothing to feel bad about, and glad you liked those. As for the trees, basic shape is made from twisted wire (1.5 mm aluminum wire) 6 strands making the trunk, branched in twos or threes at the botom for the roots and tops for the – surprise! – branches, and covered in pva-soaked tissue strips. I didn’t’ take any earlier WIP pics, might try a brief step by step later on if found of interest. Thanks for the link. Looking forward to seeing what happens next. 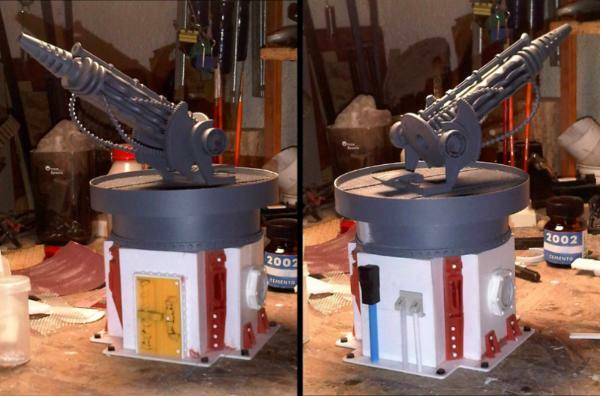 Wicked decent job on the turret and the bastion. Your rust is convincing and looks really good. @Viktor: Thanks. The barrell gets in, then. @Skalk: Thanks for dropping by, and glad you are liking it thus far. Comments & critiques are always welcome! Oh yeah...that's good looking for sure! Can't tell if that barrel is filled, appears so....the mesh fence and that tripwire looks very convincing. The lil rose tho is the icing of the cake, a lil storytelling item...very good idea! @Viktor: Empty yet, but will be filled with toxic waste (Polyurethane foam based, I'm still aiming for the +5 point bonus for picked up junk, don't think I can spare the extra credit!). Maybe some spillage too, if it doesn't over do it. Good job. You do very good rust. Barrel works well and where did the flower come from? Due credit was going to be given when finished, but you got ahead of me before I could! Please, excuse the omission, and let me state now that I got the inspiration for this from your sprue-work, and thanks for that! No worries. It's nice to know I've passed something on. I found the tutorial online, so they're not my creation anyway. @Ruglud: Indeed there are, toughest simple, fast & quick comp I'd ever figured. 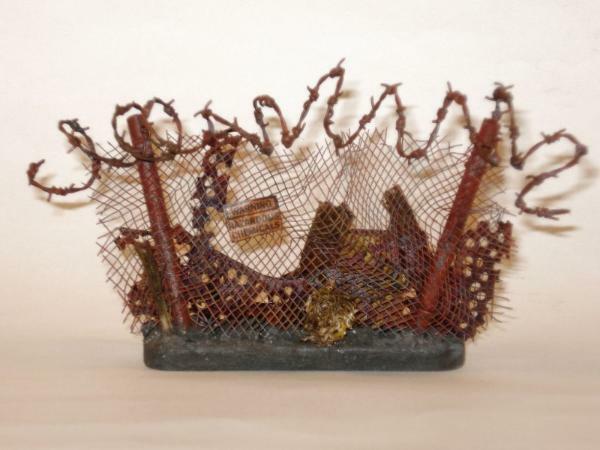 As for the sprue plants, you should. Excellent return on the effort they take, IMO (provided one does not chop off a slice from one's fingertips in the process! ), providing, as Viktor mentioned, an extra twist to a scene by adding a different - and generally unexpected in usually grimdark builds - shape and/or colour. 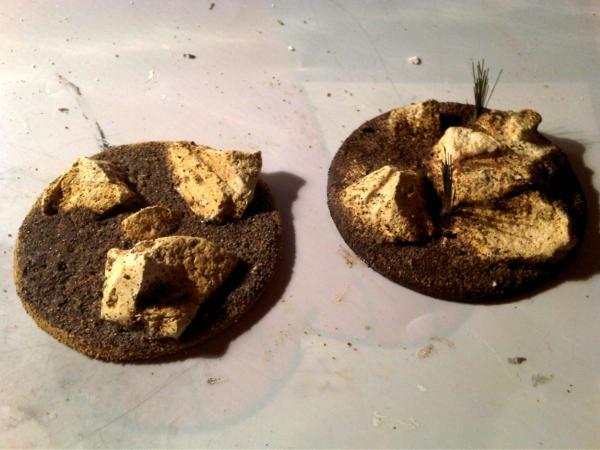 Basing: PVA & sawdust, tinted. This looks really good, I like what you did in the limited amount of space! Available space was indeed limited, a handful of ideas were left aside, I might give them a try later on (Mostly as "canvases" for effects and techniques I haven't done before, ice and snow, and OSL come to mind, as well as needed more practice with salt weathering). 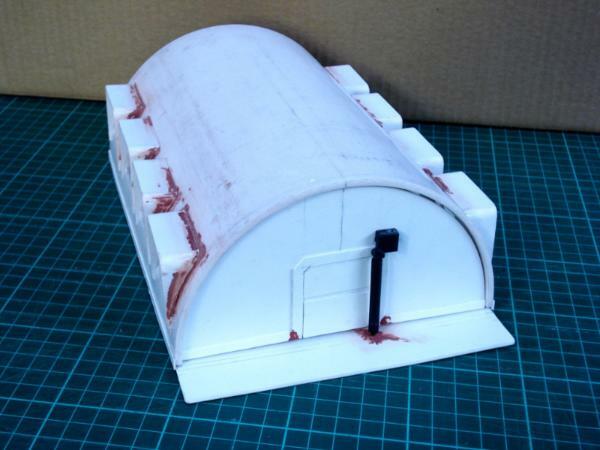 Having finished my scrap heap, and before moving on unto something else, I went back to the barrel, still thinking about building the terrain piece I'd thought of when I picked up some polyurethane foam leftovers. 1. Carved parallel grooves in a scrap piece of MDF (5 furrows, top and bottom rings and three ribs). 2. 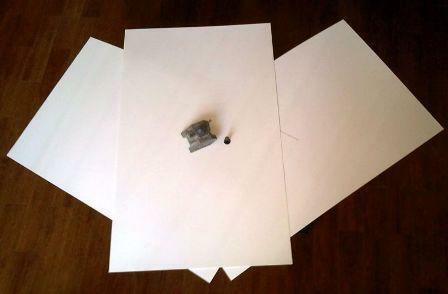 Folded over a strip of aluminium foil to make made a thicker, sturdier strip, of slightly over 25 mm wide). 3. Cut to length (For a 1.5 centimetre diameter drum, 4.7 cents long), to get the basic tin sheets for the barrels. 4. Wire, cut to same length, for reinforcing the ribs. 5. Embossed the drum ribs by placing the wire strips over the grooves in the MDF and pressing down with a second piece of wood. 6. Super-glued the wire strips and folded over the leftover foil on top and bottom to cover the wire. 8. Rolled over the stamped sheets on appropriate diameter tube (Felt tip marker, in this case) to make the drum bodies. 10. Glued on the inside (Nothing fancy here, fast drying general purpose epoxy cement). How fragile are they. They look amazing and liking the idea. For the bodies, the aluminium foil is folded over four times, that, plus the embossed ribs - reinforced inside by the wire strips, make them robust enough. The top and bottom pieces, on the other hand, are single leafs, and thus less firm, but they are pressed in with a slight concave shape, so not too exposed. Maybe thin styrene would have been better for those - and placed inside, slightly recessed from the rims and before gluing the bodies close - for added resistance, but I favoured the easy/quick build and the rugged look of the creased foil and the possibility of having some of them partially opened - can-opener wise - with outward turned tops. Following an old post in dsteingass thread and his Fallout terrain, I tried to give a shot at the theme as well. Actually, resemblance departed way too far from the original – Ended up with a rather baroque look, instead of the industrial functional from the screen shots – so I’m guessing it’s more a free version-inspired by than an actual piece build. Nice work on the junk. There's some very nice weathering in there. And a nice take on the Preservation chamber. Junk looks brilliant. Nice take on the theme. 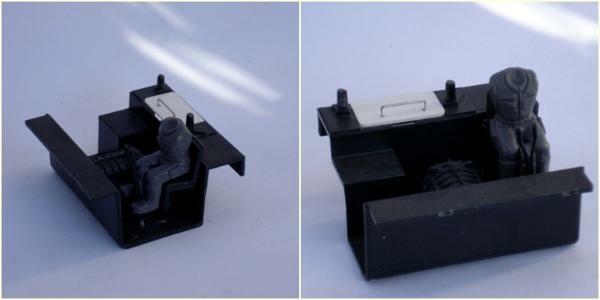 And the chamber looks awesome, from the shot with it primed up, thought it was a bought kit, looking very good. @Dr H: Thanks. With some many great masters all around, something was bound to stick in! @Ruglud: Thanks, good to see you around. Daemon Prince Junk Pile vote cast, tough call indeed. Long week, little to show for it. I'm loving the barrels, Brilliant! And I'm honored and can't wait for the Pulaski to be painted! gotta ask...what is the door frame made from? that is probably the important bit to really sell the concept! 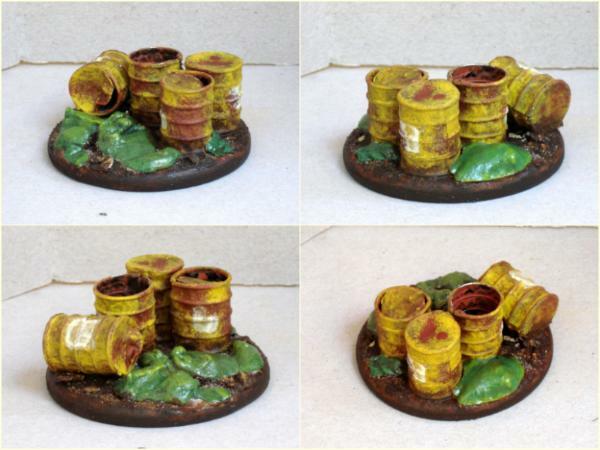 oh...forgot...junk pile looks amazing too...and I love the other barrel terrain piece...the whole aluminium barrel concept makes it probably easy to make them dented and brusied...!!! @dsteingass: More on both next, hope they keep up to expectations! 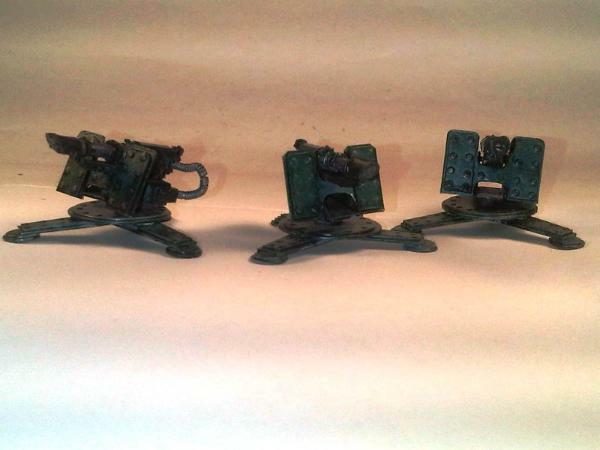 Several projects on the shelf, some got some paint slapped on. Door frame is (was) part of a toy, a rubber-band car launcher of sorts (Had to check with the former owner for this), before it ended up in the recycle bin. Rediscovered when I sorted through the said bin in search for junk for Skalk Bloodaxe's Comp, it was - I fully agree with Viktor in this - a great doorway-to-be, and so got to be refitted for this project. Couple things finished, others to come. Kept the weathering at a minimum, going for a less decayed look than usual; maybe too subtle to show at all? Finally, joined in the LoER's new comp: Accommodation, though there isn't much to show on that yet! I initially came up with a large sketch that might have proven too big to actually accomplish, or, even if built, unusable (and worse, un-storable), so I turned to a step-by-step modular plan, aiming at putting together some smaller pieces that could be grouped to form a larger piece, and thus, more manageable from both the building and use points of views. Happy new year. That looks brilliant. @Dr H: The half pipe prefab barrack was the first image that popped to my mind when I saw the theme, yet to be seen if I can pull it off. Windows to be added next, and further detailing. Where has this thread been all my life? this is amazing. Nice detail work. I like the fan. 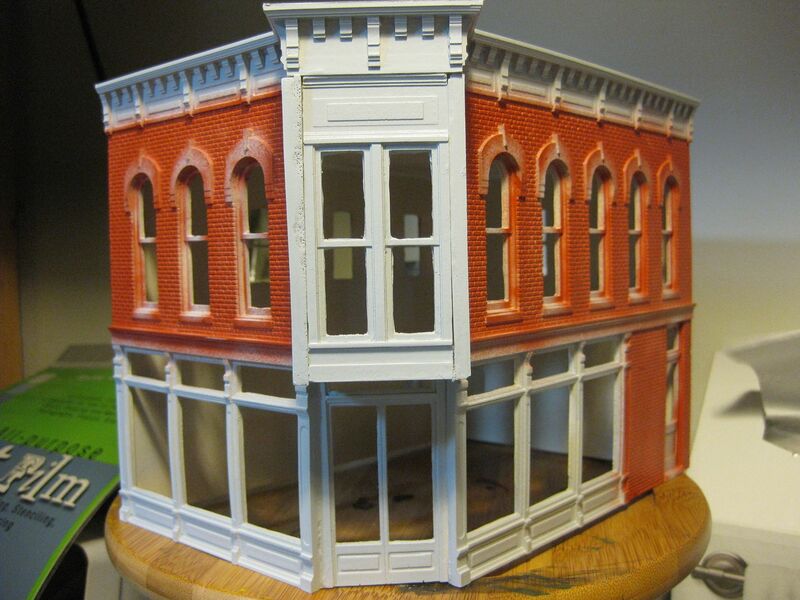 one question tho... will this building be your entry or are you making a lil scene around it to go with it? @MWHistorian: Welcome, and thank you! @Dr H: Thanks, though it's been so hot lately that adding a fan can hardly be called inspired! @Viktor: Glad you are liking it thus far, thank you! As for the finished piece, yes, I did come up a somewhat larger plan (Well, sketch at least), with a scenic base and a few other pieces to complete it as well (Light posts, perimeter fence, gangplanks and sentry gun emplacements come to mind), but decided to build and at least come close to finish the basic piece first - and have a "minimum" entry done at least - before plunging into a potentially too overreaching and uncompletable build. C&C are, as always, much welcome. as stated on the comps thread... coolness distilled! There's some amazing stuff on this blog... I'm in. @Gitsplitta: Welcome, and thank you! Fitted the windows a little better - yet not perfectly, but it'll have to do for now - and, after going over the Contest Rules, filled in some gaps (Avoiding silly gaps seems to be important for scoring, go figure). Thanks for stopping by, your C&C are welcome. PS: On another front, still struggling with my guardsmen for Bebop's Comp, will update later on that. Cheers. Looking outstanding to me buddy. Your building a solid body of work here for many people to get ideas and admire. The neatness thing in the comp is to try and get people to push that bit further and to give us some way of distinguishing between the excellent work done by so many people. will this glorious build see any weathering in the foreseeable future? 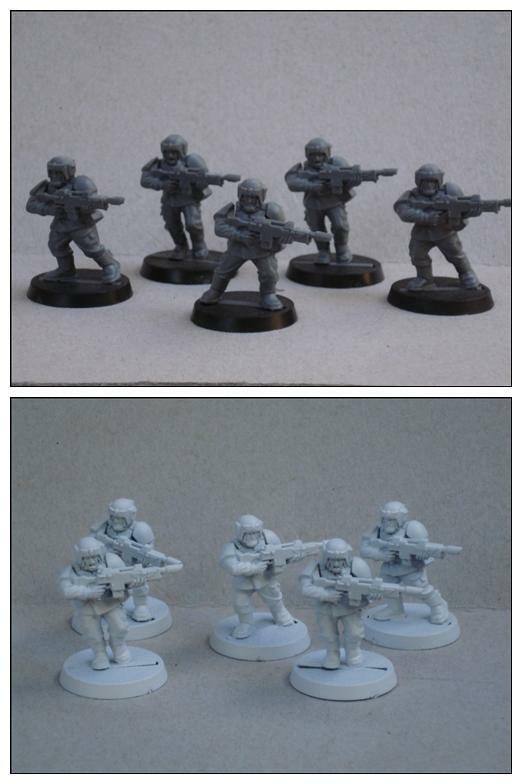 as for the guardsman...looks stunning...is that digi camo or a more subtle approach to stripe and patches? @Viktor: No, no see through - just paint, tough the idea of bunks and lockers did came across. Maybe in a second one, given time. As for the mint look, I guess things do have to be new some time, don't they? and urban camo ...that one was achieved ! in what terrain type will this lodging be located? 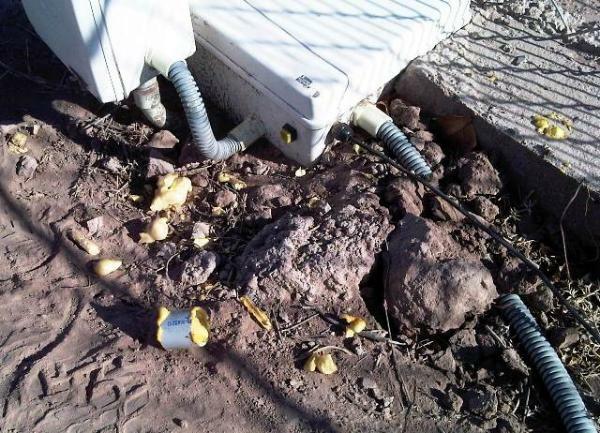 probably some desert? Looking good. Liking the glass effect and the stencil on the roof. Camo' on the chap looks good and blue armour is a nice change. 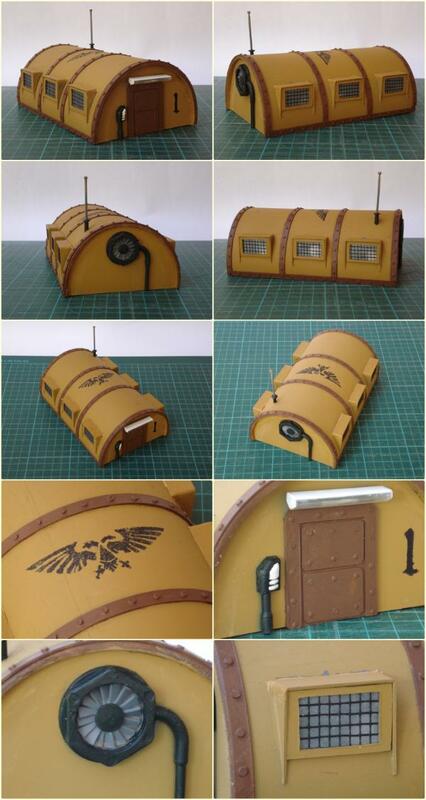 Very nice work on the Barracks! @All: Thanks for stopping by. 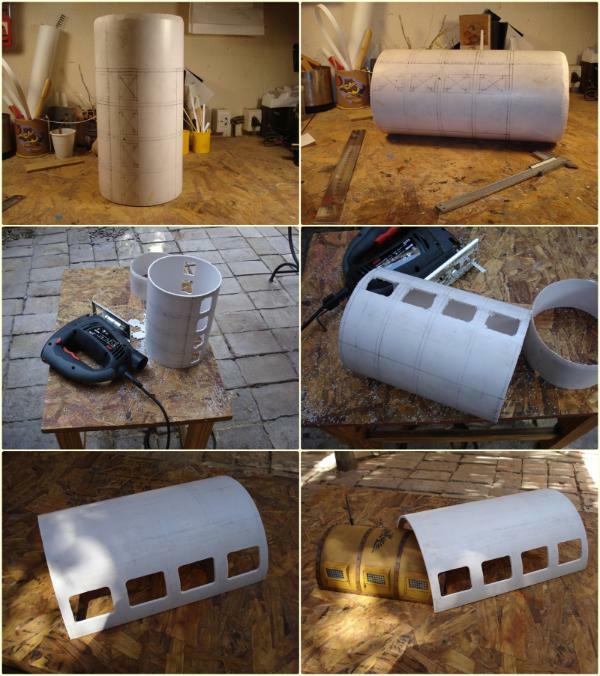 160 mm PVC sewer pipe (Repurposed leftover but not recycled), and cut out windows for making possible to see inside (which means the interior will have to worked on too) once done. Still far from where I'd want to get, but on the way! Great googly moogly. That is going to be impressive. @Viktor: Just five more minutes ! @Warboss: Welcome, and thank you for the reference. I'd looked for ref pics browsing for military camps and barracks, and never came across the proper name for the type of building. More on this later (for real this time). 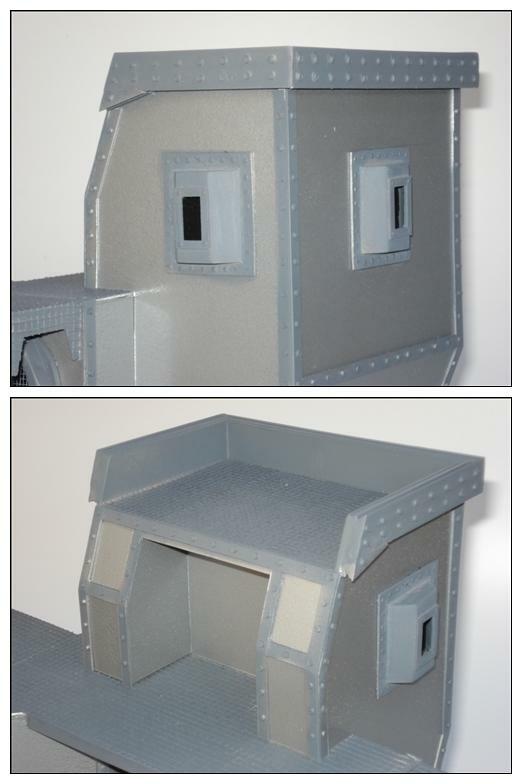 Mounted the window eaves, biult the new door, and dry-fitted the front and rear walls. @Viktor: Thanks for the input, will probably do. Excellent work, looking forward to this. On the corrugated thing, yes it was more in keeping, however I am with Vik, in the future they will have better materials, flat looks brilliant on the other one. I do have a suggestion. Roof vents. 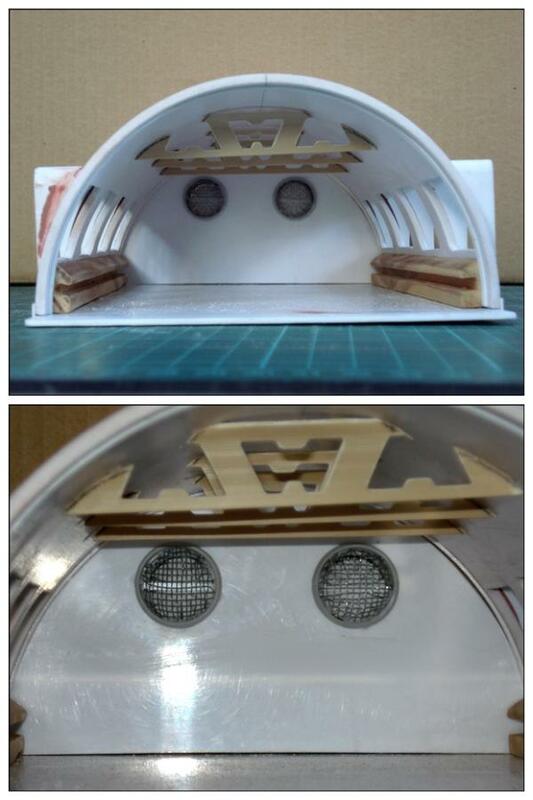 Just a modelled cover to show a means of air flow, I know you have the excellent fans, but look at these kinda buildings around the world and you will see simple vents on the roof. Give you something to add your brilliant detailling skills to! Love that... very clean and sharp. The smooth walls make it look more substantial and permanent then a corrugated one would. You could always make a small corrugated one for the toilet. 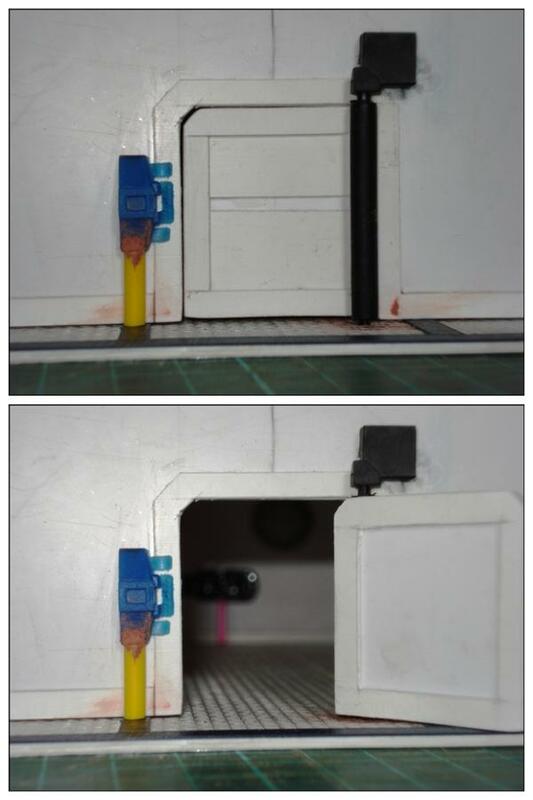 and for the working door. @All: Thanks for your comments and input. Flat cover it is. I had not noticed the first girder was crocked until I saw it in the the pic. Fixing that is on the to-do list already, as are the suggested roof vents. Fans are good and what were the girders originally? @Dr H: The girders are cut outs from edge trims (Also found it as nosing) for ceramic flooring. Chopped off the outer part (the nosing itself), and used only the strip that is supposed to lay between the tile and the carpet for the beams. Hope the pic helps to make sense of this. Good use of a random part. Brilliant idea. Looking good even if it is crooked. (Straightened the askew girder too). Basically done, pending riveting and window panes. As always, your C&C are welcome. Good work. I like the construction of the roof vents. Could do with some furniture inside though. Looks great! Keep going. Moar. @Dr H: Thanks. I agree on the furniture issue, would you happen to know where I could get some? Although it does depend on how much time is left in the competition. Talk about, running with an idea. Roof vents are brilliant. Overall is brilliant. And I am positive you can manage some furniture. 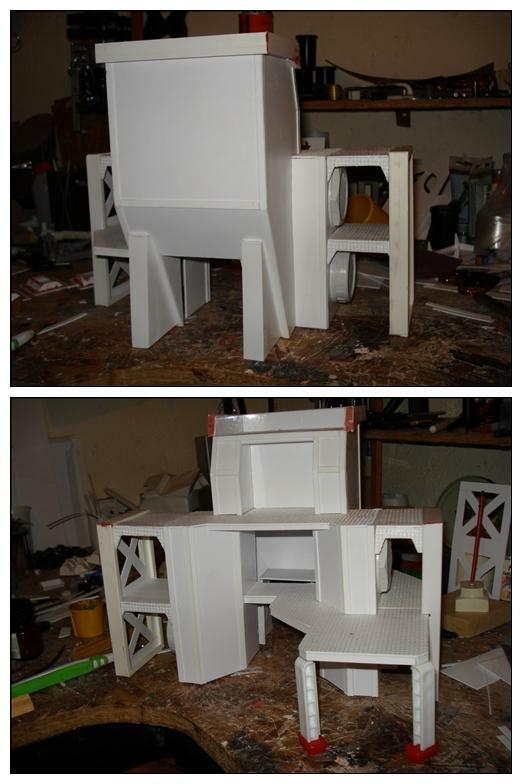 As I said to Vik awhile back, you are doing military utilatarian, so pallet beds and simple tables. Does not have to be chipindale!! The details on your building are really great! @Camkierhi: Pointing someone in the right direction is as important as actually getting something done, so the merit for those goes to you as well. @pfibp: From what I see you do, I reckon you do have an appreciation for detailing, so I really value your comment, thanks! Which undercoat do you use? And I agree, I love that undercoat look, it looks a proper piece of kit then, instead of a toothpaste tube and a cocktail stick. That is brilliant LT, simply brilliant. I thought the first version was great, but this surpasses it. Excellent detailing and execution of your ideas. 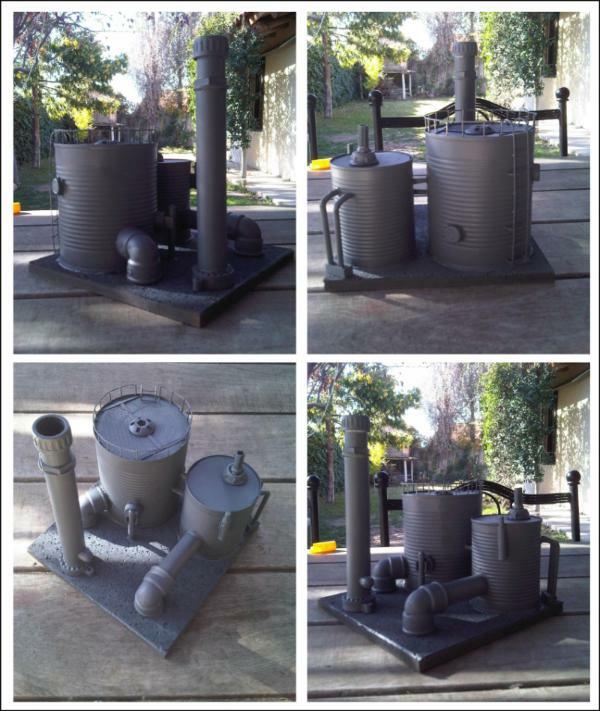 @Camkierhi: Spray-can undercoated with Rust-Oleum 2x1 Grey Primer. The top vents really added to the piece, IMHO. And to round up today's update, le pièce de résistance: I still don't know if I can paint OSL, but I figured I could do OSL! OMG! You guys are really pulling some stops out for this comp, that is looking good. No advances today, some random ramblings on their place instead (And due warning to those who might be wondering around, in case there are any). It’s been brought to my attention lately that my approach to the hobby might be slightly obsessive. (Clarification: For lately, I mean I got an ultimatum, since the subject has come up more than once, and has a long-time standing. And slightly was added be me, there was nothing about it being faint on the comment!). Mowing the lawn: Ankle deep grass is too long, and feral is not the look we are after for the yard. Shopping: Restocking is not scavenging through construction site dumpsters for useful bits when the fridge is empty. Personal hygiene: Yes, even that came up. I emphasized I make a daily point of washing off eye boogers, it turned out it doesn’t count if I do it just to be able to properly see the current build I’m working on. Housekeeping: Replacing burnt out light bulbs – other than those on the workbench lamps – and having running hot water in the bathroom seem to be important too. It doesn’t matter if we are in the middle of the summer and daylight runs from 6 am to past 9 pm, or if it is too warm to shower with hot water in the first place. So I did what any self-respecting man who plays with toy soldiers and is mildly addicted to plastic crack would have done in my place: I manned up, rolled up my sleeves (Just a figure of speech, actually, as mentioned above, it’s been so hot lately that the sole idea of wearing long sleeves makes me sweat). I nodded, conceded, and set about to solve the problem(s). I called in sick (Not as bold or unethical, depending on your personal take on labour, as you might think, since I am an independent contractor, so I actually just didn’t work today), and threw myself to the tasks at hand. So, no update today, unless I’d post pics of the trimmed grass, not-dripping taps, and shaved and tidied up self. But I had time to think about the hobby – they can shackle my body to a lawnmower, but not my mind! –, and decided I’ll keep on nonetheless, OCD et all. So stay tuned if you like, more to come later on. Thanks sorry to those stopping by. May your blades stay sharp and your brushes pointed. 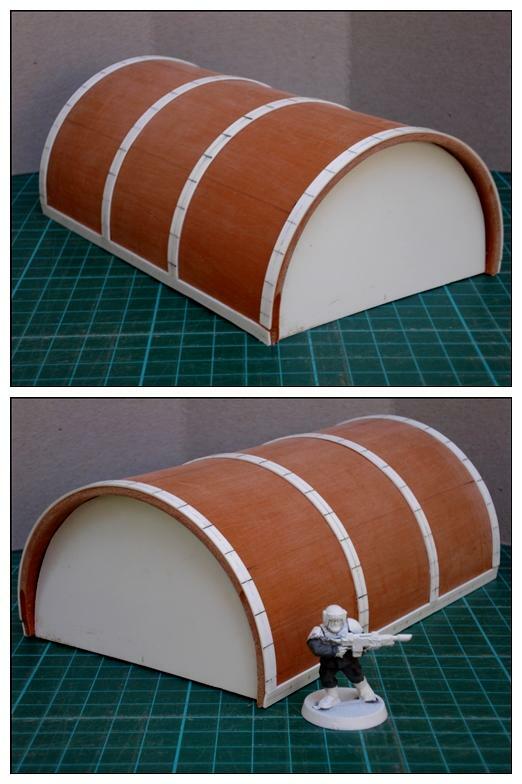 I love the Quonset hut. 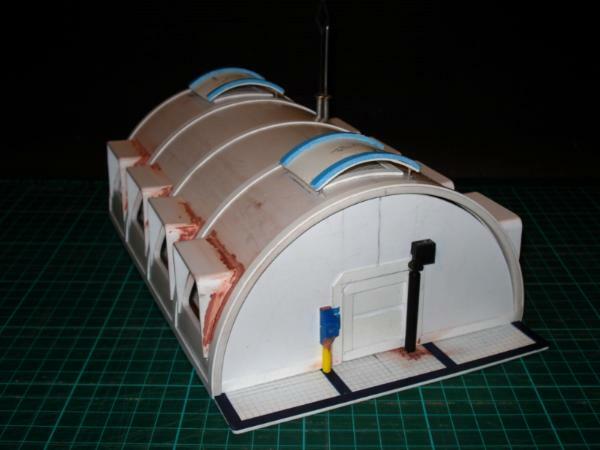 i will borrow from your ideas and probably will attempt a quonset hut building as well. Thanks for sharing. This is excellent, ambitious scratchbuilding. Everyhing is scaled nicely and looks great. Good job on the lighting. 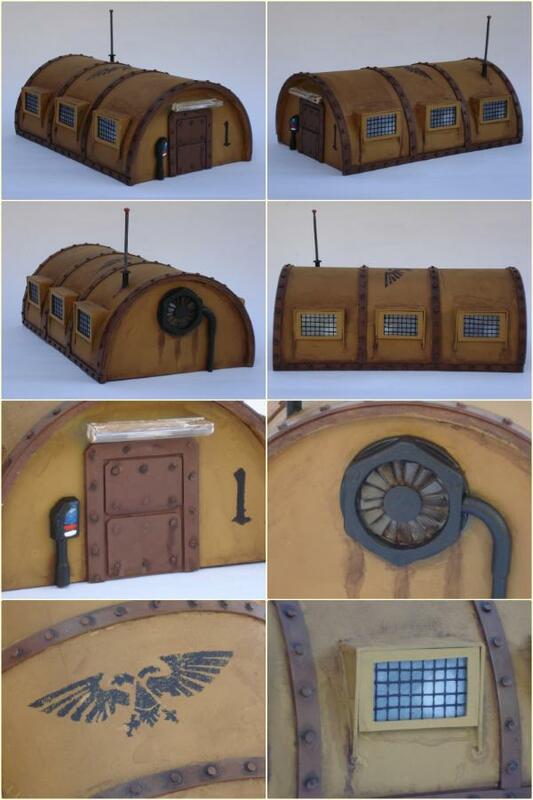 and i agree with you to the fullest...the strongest part of the hut is the upper vents.... these look simpy brilliant! @Nerdfest: Jealous? Come on, I had to rig wires and lights and power it up to get at least close to what you do with a brush! Thanks for stopping by, BTW. @silveroxide: Glad you do. I'd love to see your take at it (And let me know if you'd want to know/see anything else of this one if it might be of use). @smithy: Flattered, thanks a lot! @Dr H: Wanted to do some experimenting myself, an even got around to make it work, too. Does this mean Ann Margaret's not coming? Hiya mate.... Love this! Top drawer stuff..... really cool! One tiny comment from me... but its WWWAAAYYYY late..... is maybe to have a little vent unit / box coming down from the roof under the vents...?? Might add a little more interior texture and detail....... but hey..... hats off... its awesome! 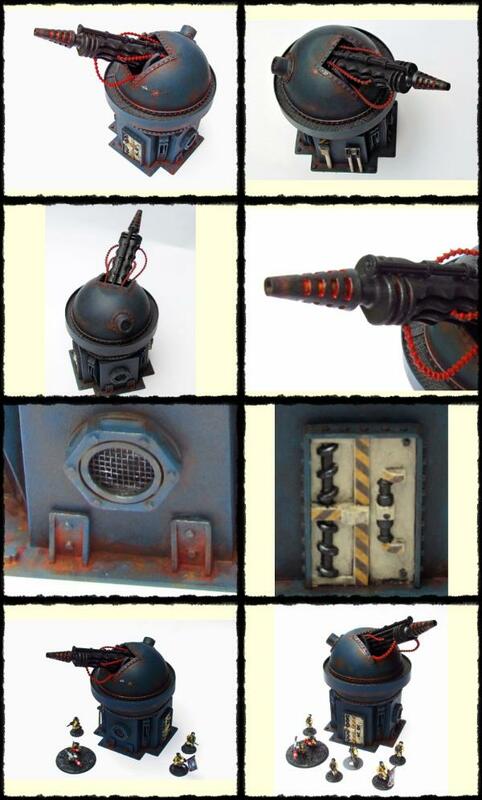 ps...... i might be jumping the gun a bit..... but are those the components of a baneblade turret?! good times! @Ruglud: TY. And mystery unraveled. And too true - as mentioned before - the priming/first coating of a scratch build is really the turning point from the random, uneven collection of bits and parts to an actual something. On another topic, bullseye on that call, WD N° 132 vintage Baneblade it is! If it turns out too small or too dissimilar to the current models, it can always turn into an Australis pattern build, either previous or derivative from the actual one. More than ever, C&C are welcome. I have one of the old Armorcast baneblades/shadowswords... it's considerably smaller than the modern one. Still.... it's a BANEBLADE BABY! Looking good, glad to see Rogue Trader living on! Yes, the templates are funny like that, I really wonder how they were developed. 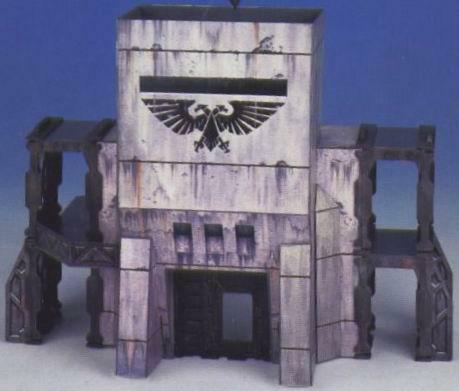 It seems a safe bet to assume the example build shown in the original article was NOT built using the templates that were ultimately published in the White Dwarf. So far it looks well on it's way to being a cool build! 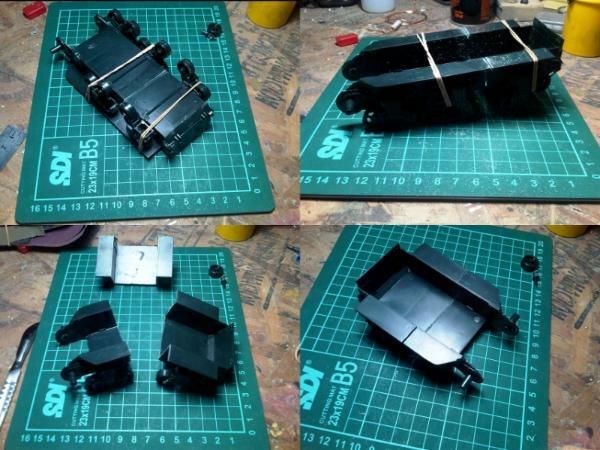 The main hull where the main turret mounts will get a bit tricky thanks to the wonky templates. In terms of weapons, the old BBs (this one and the two Biasi/ Armorcast ones) had a single heavy boler on the front hull mounted turret, as opposed to twin-linked heavy bolters. Also, they had 3 bolters on both side sponson instead of twin-linked heavy bolters. 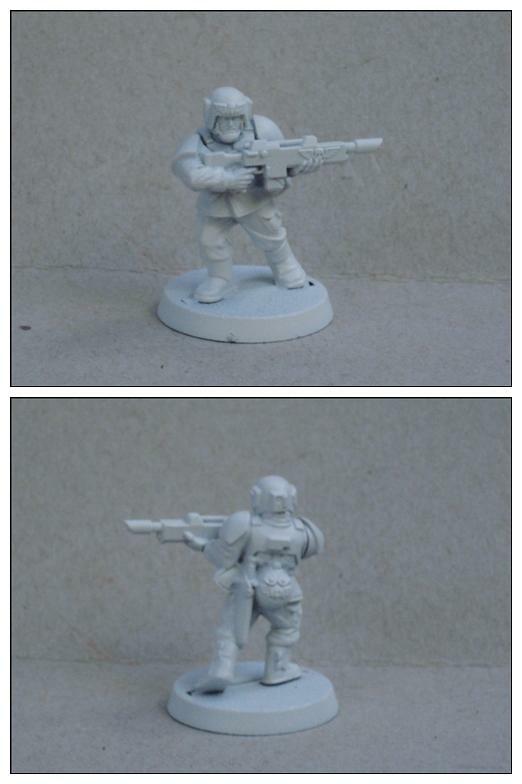 If you update that you'll be fine with regards to having a model you can use in a game of modern 40k. 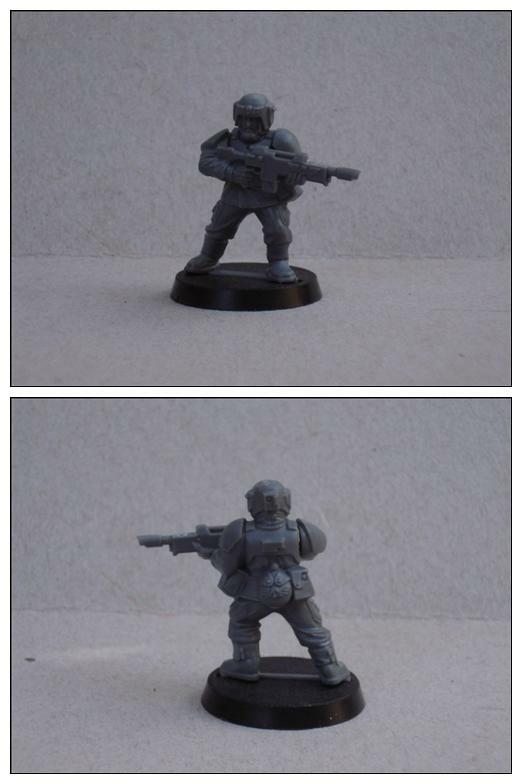 Of course, if you're playing against a stickler, they may not like the fact that this BB is only 2/3rds the size of GW's plastic kit! Keep it up, I'll keep a watch! Oh, and I really like your buildings/ terrain! @Gitsplitta: Good to know it, thanks for that. I'm now struggling with the main hull right now, just a bit tricky might be somewhat of an understatement! Games wise, I do not play much (if at all) in an easy-going group, so I don't think the weapons config or WYSIWYG would be a problem (Undersize might draw a growl, but no more). I'll see what to do about the smaller guns considering mostly looks, and what I have laying around (no bits to speak about) or can came up with. Great, hehe, when I got to this point I certainly did the trimming, but I kept the top plates unaligned as they were, good on you! Glue setting on said main hull, half of it redone for proper fitting. Following great work is it's own reward. Love watching people who excel at scratch building. I know that feeling! In this case, I just keep telling myself its a detail on my BB only I would notice (whistles to self ). Like it, following this one closely, got to make some of these soon. 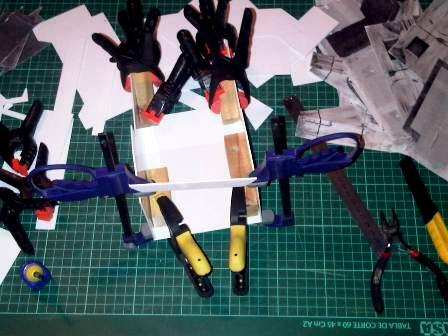 @Heliodore: Hobby (and not only hobby, mind you) OCD? Indeed. And proud of it too! @Camkierhi: You really should. It'd make a great addition to either display shelf or army, This particular version (WD 132) though, as said above, a) is sensibly smaller than the current version; and b) the templates themselves are far - far - from accurate. That can either be a pain, or a challenge and opportunity for putting down a persona imprint on the build. Anything else, just ask away. @MWHistorian: With your background, you were bound to get straight away! I took some leeway with these, but, can they really be too big actually? C&C are welcome as always. 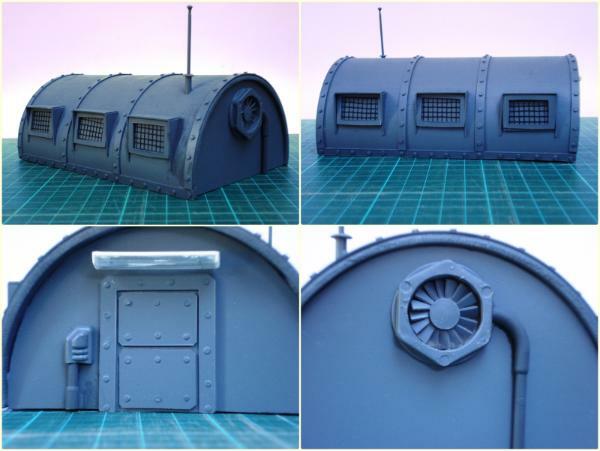 PS I started painting the barracks as well, since it's the same colour scheme as the first version, at it is just basecoated at the time, I guessed pics would've been redundant, but it is coming along too. Hehe, I agree, OCD can be a good friend in times like these. I actually went ahead and re-did the part of my top plate that was wonky, feel much better now! Great, the top hull looks solid! "Dreaded" is a good way to describe the building experience here! And you acquire another viewer. Totes subbed. @Heliodore: Glad you approve. The hull and the gun mount in the turret have a couple more plates than those in the templates, but I guess it looks the part anyway. Just painting on and off now, will try and get something to show later on. 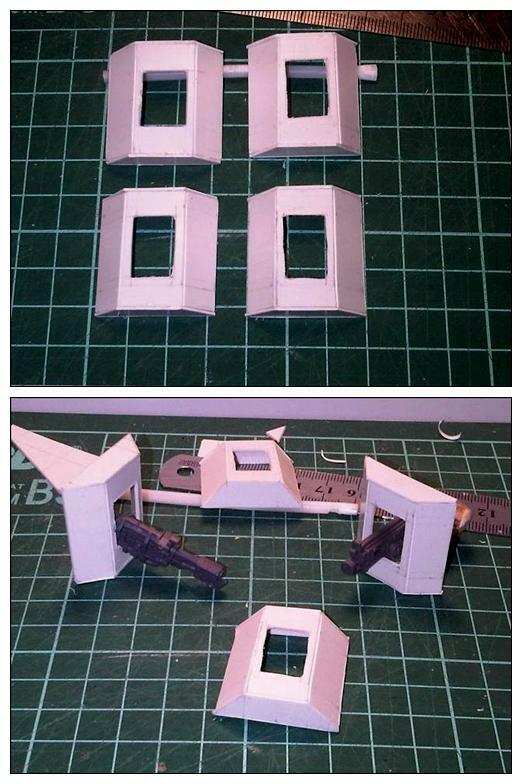 The gun mount in the main turret was one place where I decided to only use the templates as a rough guideline, I think I was ripping my hair out by that point. No problem whith more plates, you got to do what you got to do! Now, looking at the top hull again, it looks as if you may have flipped both the top and bottom parts of it when you put it together because the rectangular hatch is meant to be located on the area of the hull's surface where the sides come closer together, and the main turret is meant to sit on the wider part of the top hull's surface. 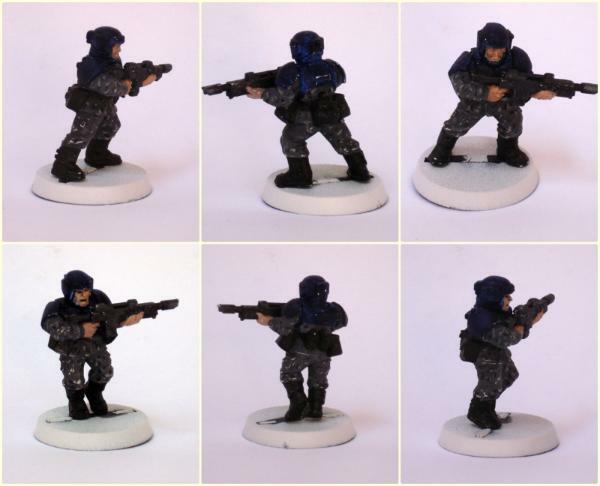 This is only an issue if you want it to look very closely to the finished model in the article. It can certainly still work as is. I hope I'm explaining this well enough. I apologize if I'm back-seat driving. I do not know how long I've looked at it, I I yet hadn't noticed! So much for MY observation skills! Your point was absolutely clear, and there's nothing to apologize for, if anything, thank you for taking the time both for watching and bringing it up. What I do know, is that it will be solved one way or another! @Briancj: Ja! Not slow, you just have your own pace. So does good wine. You are welcome any time. No need to feel embarassed, I had to constantly look at the pic of the completed model, back and forth, in order to get this guy done, it is not an easy project and the instructions aren't as helpful as they could be. I'm glad I could help then. 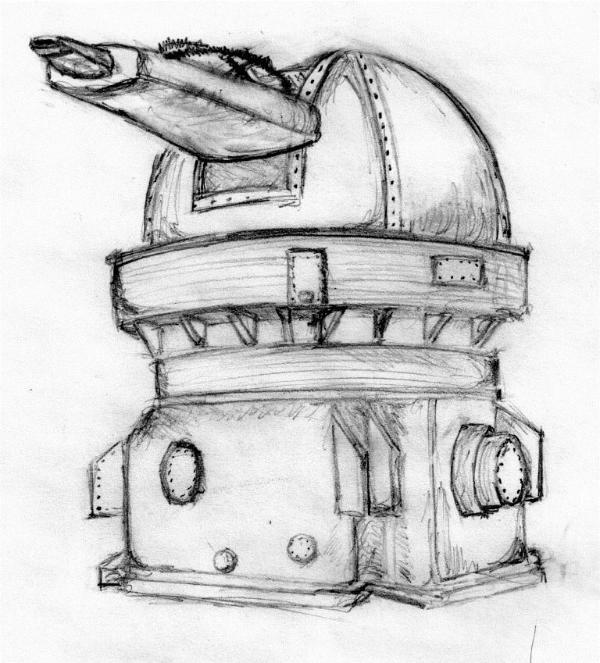 Yes, you could just switch the hatch with the turret mount and make a left-handed BB, it wouldn't effect playability and it would be less of a headache, but will your "OCD" allow for it? I'm actually from the US, but I go to school in New Zealand! Letting it dry now before moving on. PS: I've been reworking on the Baneblade hull to fix the reversed layout, not much to show on that front, as I'm just getting to where I had already gotten, but on the right side this time. Looking great, and quite large! Is this going to be in the snow or is that purely undercoat/glue? And on the tank, well we all knew you would, besides we would have all pointed and said look it's that lefty from downunder! Dude! Your work with angles is VERY impressive! My brain melts down when trying to figure out how to make complex shapes like that out of PC. @dsteingass: That's why I always leave mine outside the workshop! 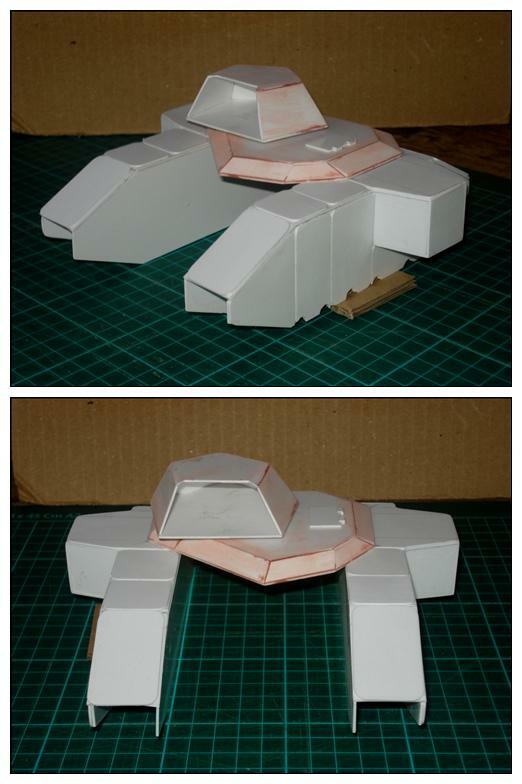 Mounted the rebuilt top hull, started on the lower body, and alongside, built and mount the side turrets. 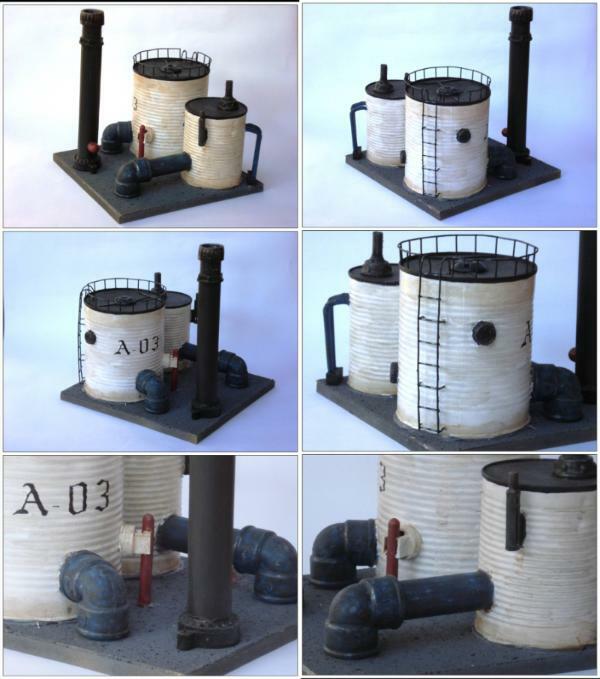 @Camkierhi: The base is 30x30 cm (Rather large, actually, especially when thinking of transportation and storage). It will accommodate the building, and have some spare space on the sides for "landscaping". Starting to look the part now. Keep at it LT, you're making great progress! Tank really coming together, looks brilliant. And did wonder what you were upto for a minute, but that looks awesome for the base. 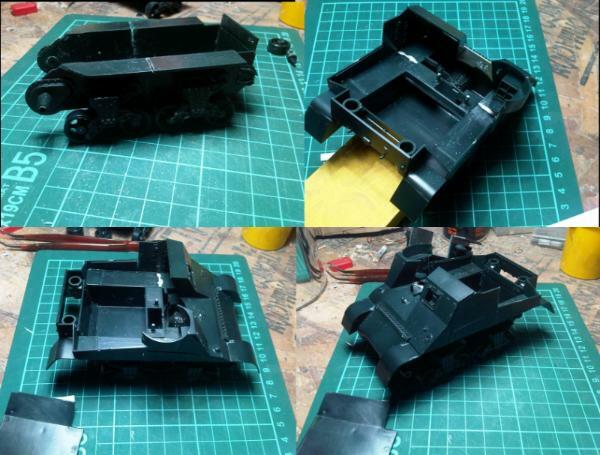 Good work on the tank. Really taking shape now. Interested to see how the base turns out. Is there a particular reason that it will be standing on a mound? Just curious. @Camkierhi: Glad you like so far, thanks. As for the raised base, two ideas behind (or is it beneath?) the mound: From a realism point of view, it would be to ease rain water drainage and prevent humidity and even an eventual flooding. And that answers my possible follow-up question. 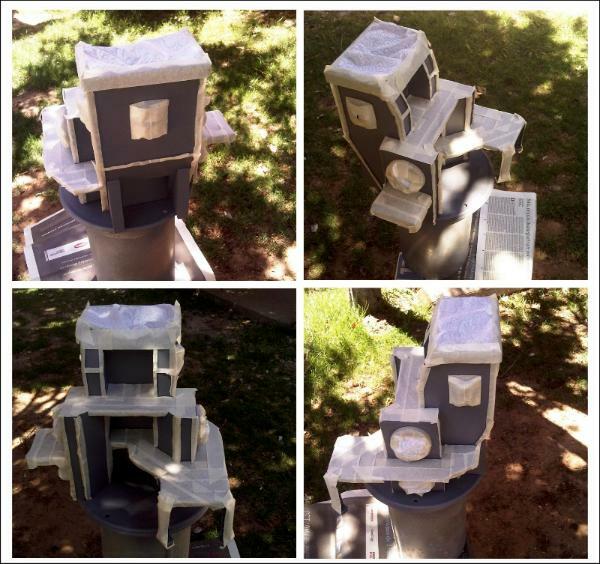 Dry-fitting together building and base.